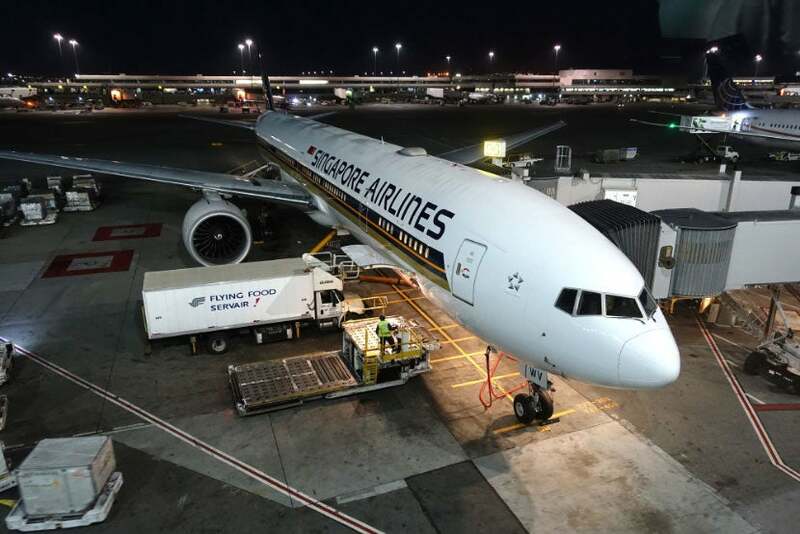 Late last year, Singapore Airlines shared the news that it would re-launch nonstop service from the US — in 2018. 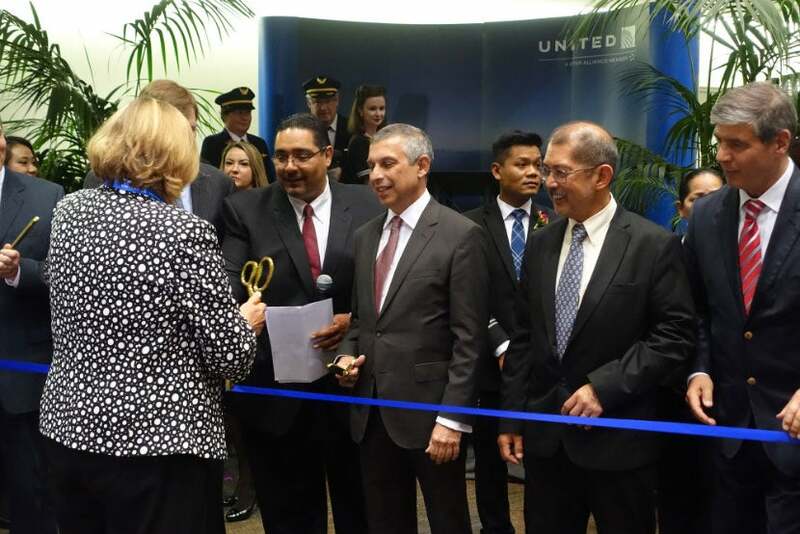 Then, just a couple months later, United made headlines with an entirely unexpected new route announcement of its own, beating its Star Alliance partner to the punch. 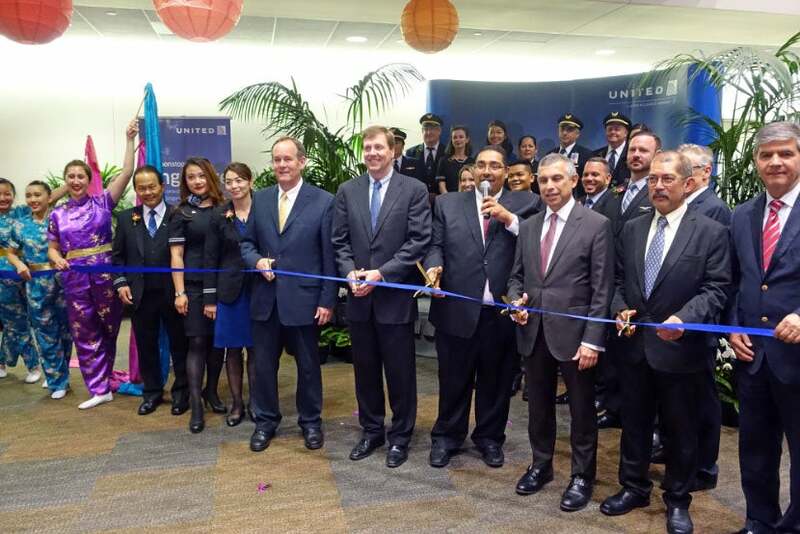 United’s nonstop flight from San Francisco to Singapore launched Wednesday night, and I had an opportunity to join the very first flight. 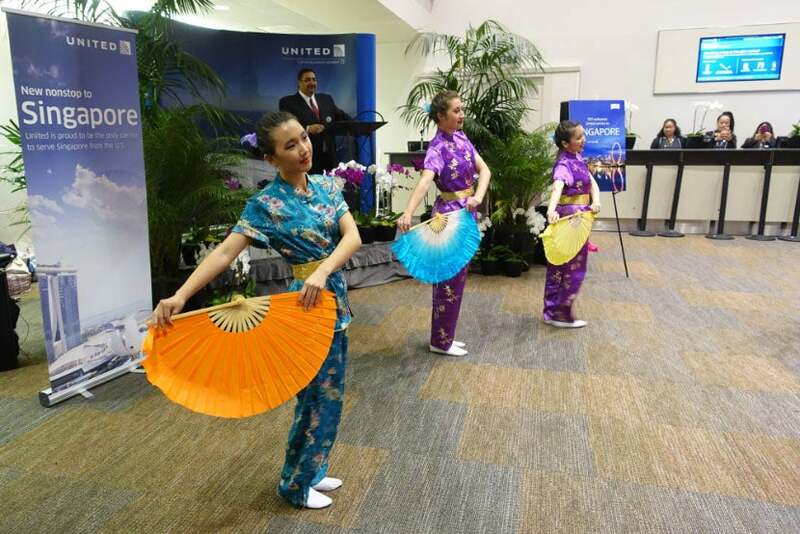 United flight 1, which departs SFO late in the evening and arrives at Changi Airport in the morning two days later, clocks in at nearly 16 hours of flying time, with a route of roughly 8,500 miles. 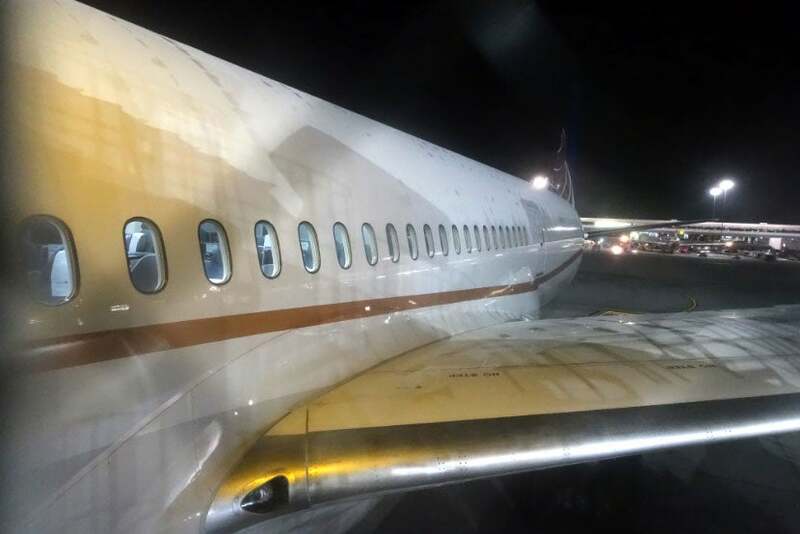 On the inaugural, however, we flew nearly 9,500 miles, with United selecting a slightly indirect route that took us past Honolulu and Guam, to take advantage of lighter headwinds. 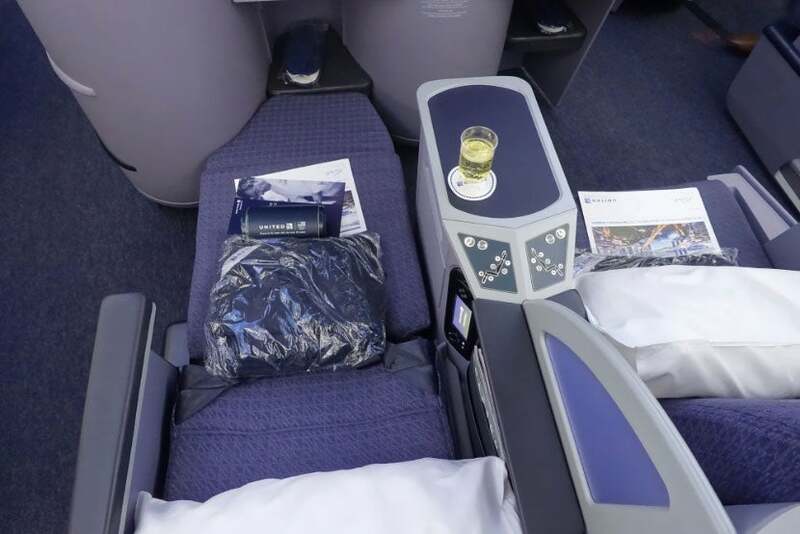 Since only full BusinessFirst awards were available (at a whopping 175,000 miles each way), I booked the inaugural flight as a revenue flight in “W” class and applied two of my Global Premier Upgrades. The fare (including segments between NYC and San Francisco) ran me $1,429 round-trip. Fortunately, my GPUs cleared a couple weeks before departure — while economy looks fairly comfy, this is a very long time to travel in coach. 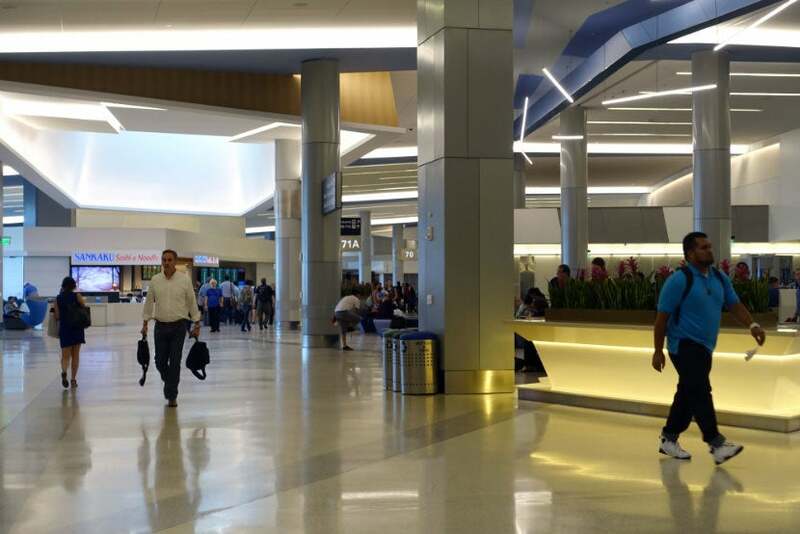 I’m earning 22,018 elite-qualifying miles and 14,619 redeemable miles for the round-trip. 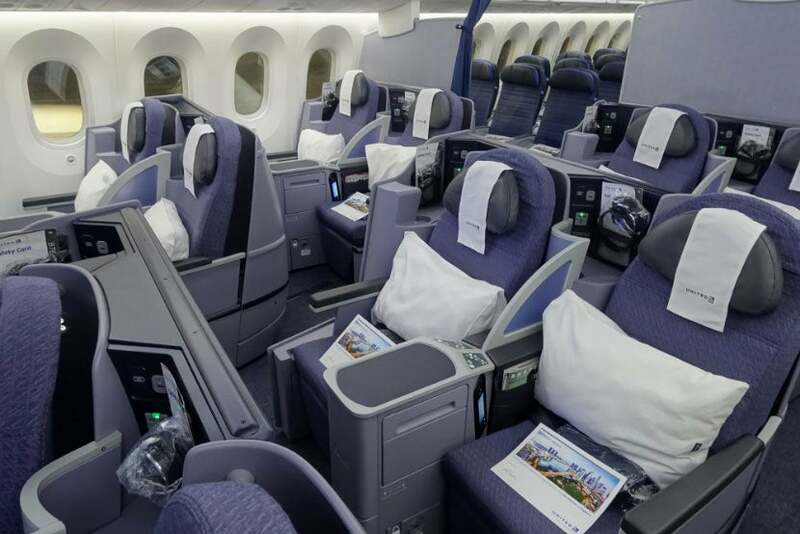 If you’re looking to use miles for Saver awards, you’ll need to redeem 70,000 miles each way (for flights operated by United). 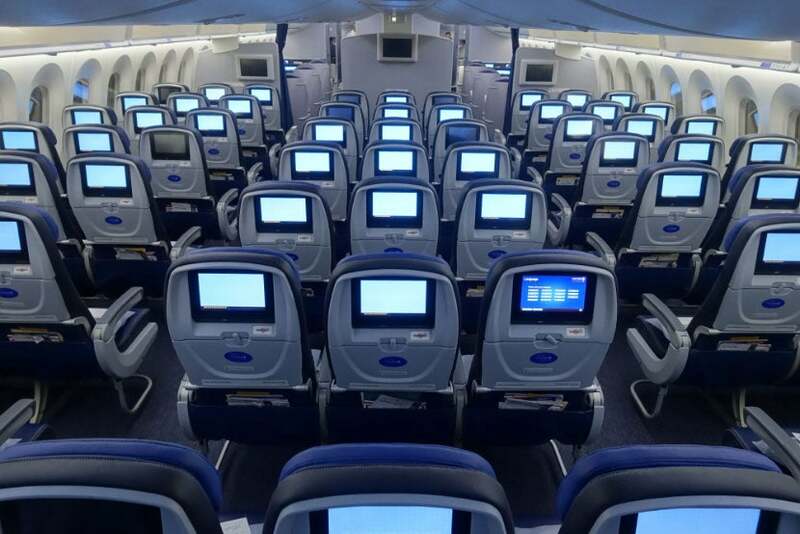 Economy class, meanwhile, will run you 40,000 miles each way. 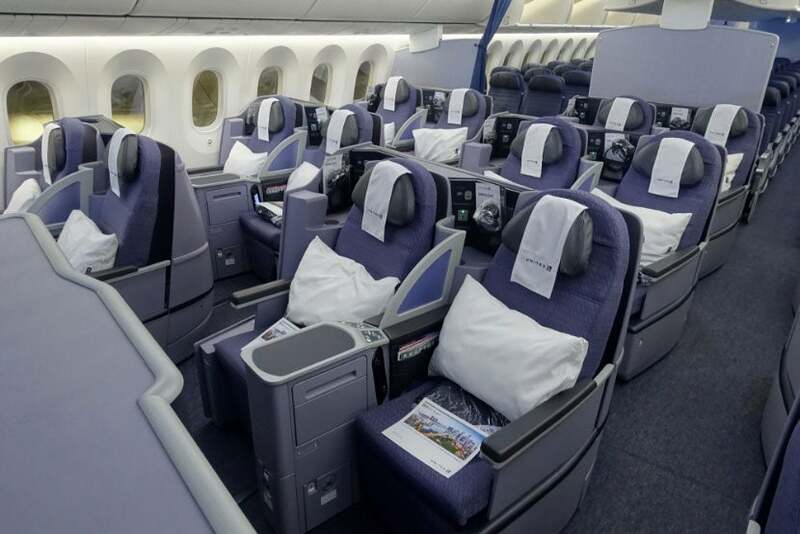 Paid business-class fares start at around $4,400 round-trip. 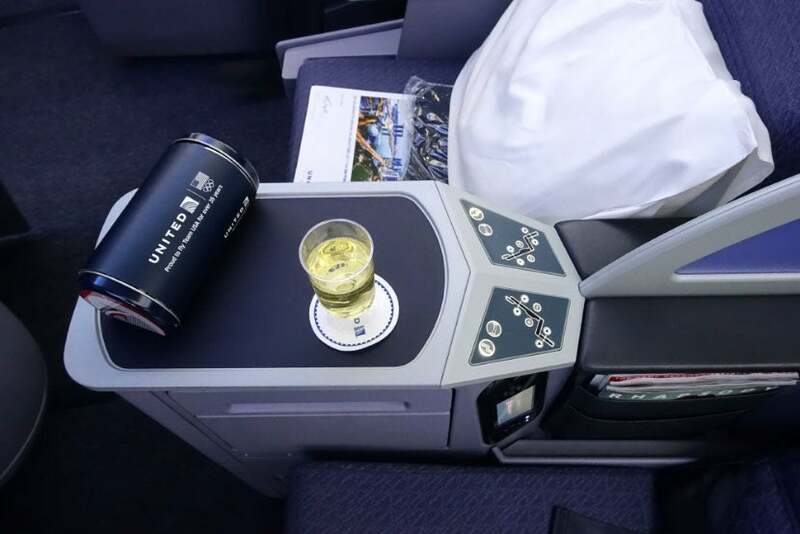 Since United’s new nonstop is only available from SFO, if you’re flying from LAX, JFK or IAH, you may be better off booking a one-stop flight operated by Singapore Airlines, which offers a more sophisticated experience in business class. 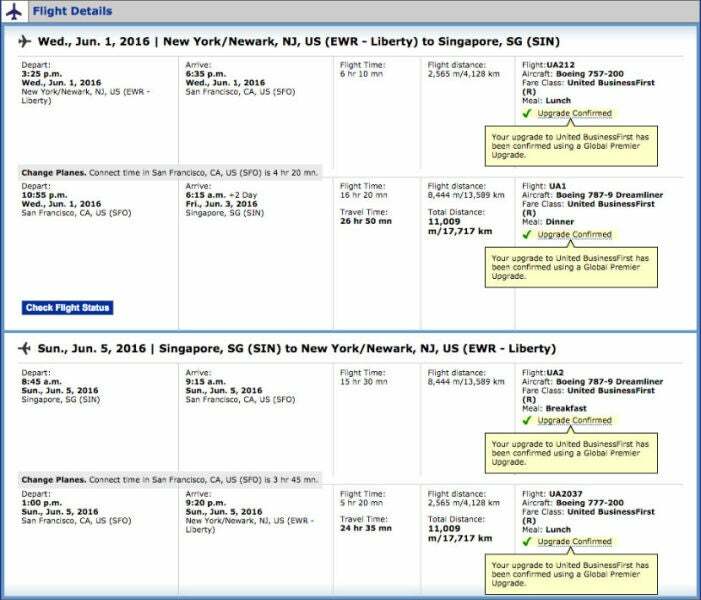 Singapore charges roughly $4,500 round-trip from all of its US gateways. After a very pleasant flight from Newark (including a killer ice cream sundae), I arrived in San Francisco roughly four hours before my Singapore departure. 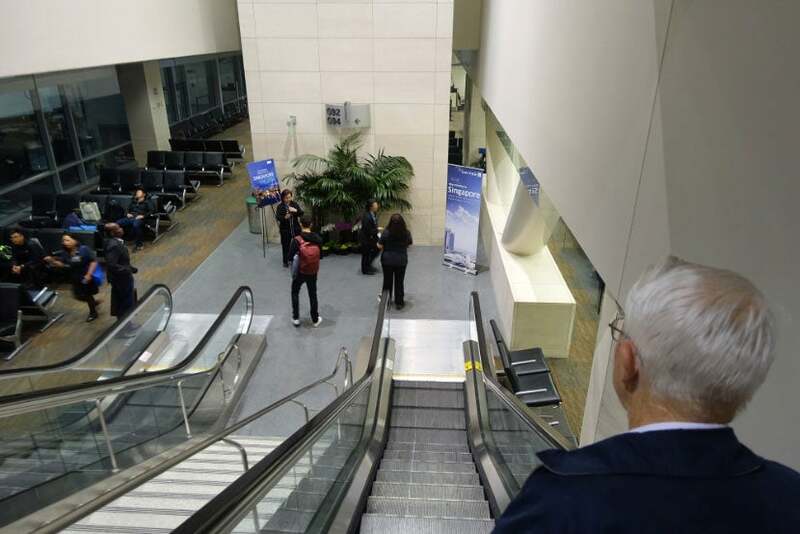 United’s been working to renovate SFO over the last few years, and a new section of the terminal opened very recently (above). I headed straight to gate 94, where United flight 1 was scheduled to depart from a few hours later, to snap a shot of our arriving Dreamliner. 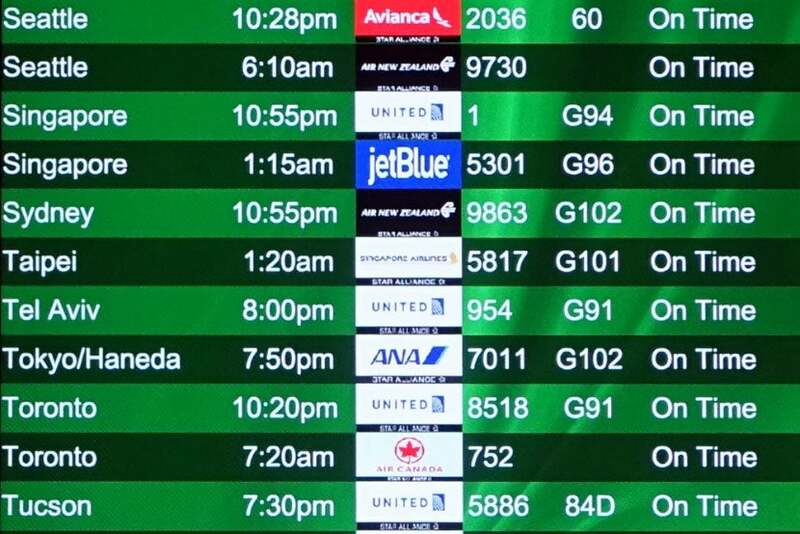 The departures board showed two flights to Singapore, though only the United flight operates nonstop. 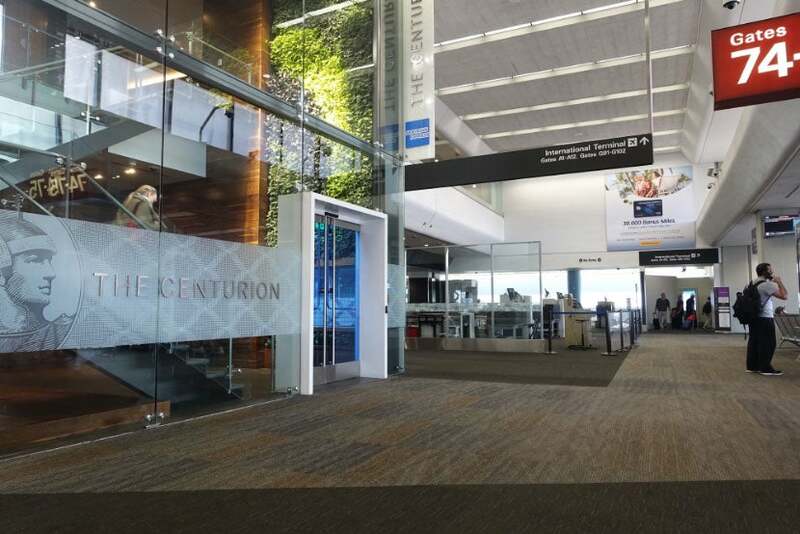 After that, I headed straight for the Amex Centurion Lounge, since I can get in for free using The Platinum Card from American Express. 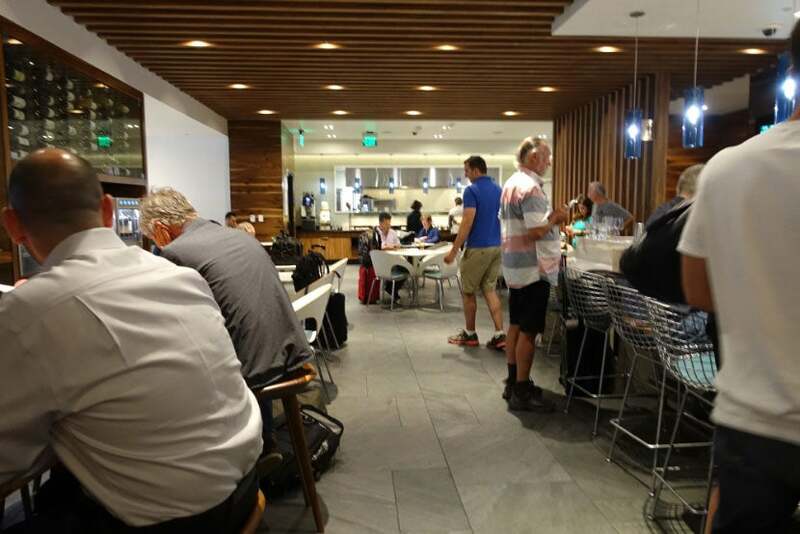 I could have also used the United Club, since I was flying in BusinessFirst (I also have access as a Premium 1K member flying internationally), but, well — the Centurion Lounge was a no-brainer. I had visited the lounge just a few days before, and it was packed. Fortunately, on a Wednesday afternoon, there were a few seats available. 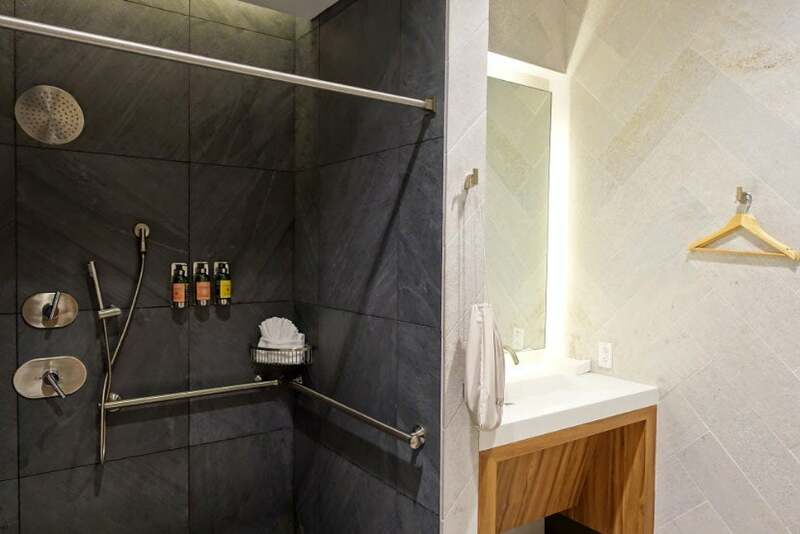 After a quick bite, it was my turn to use the lounge’s one and only shower, so I refreshed a bit before heading back to the international terminal to check out the gate activities. After a short walk to the international gates, I still had about 30 minutes to go before the pre-boarding celebration began (as it turns out, a four-hour layover was a bit too much), so I walked around for a while. 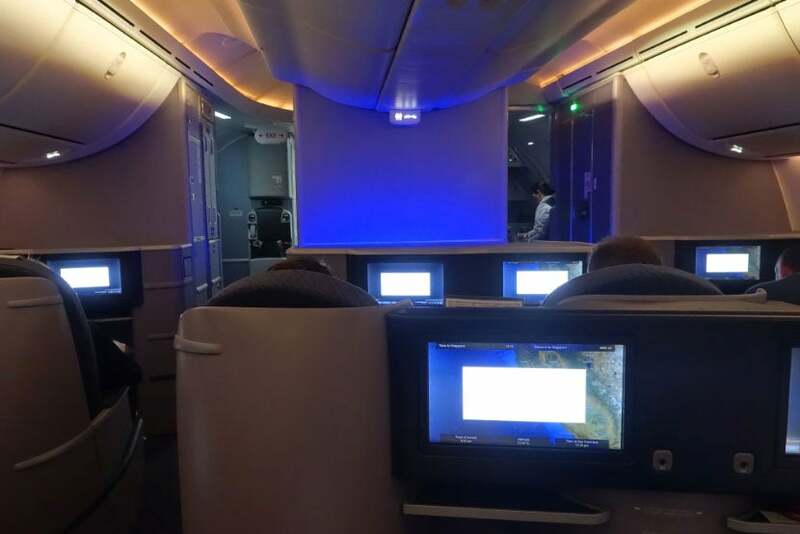 Interestingly, there was a Singapore 777-300ER parked right next to our Dreamliner, but unlike the UA plane, this SQ flight has a stop in each direction. Then, after another lap around the terminal, it was time to head down to G94. 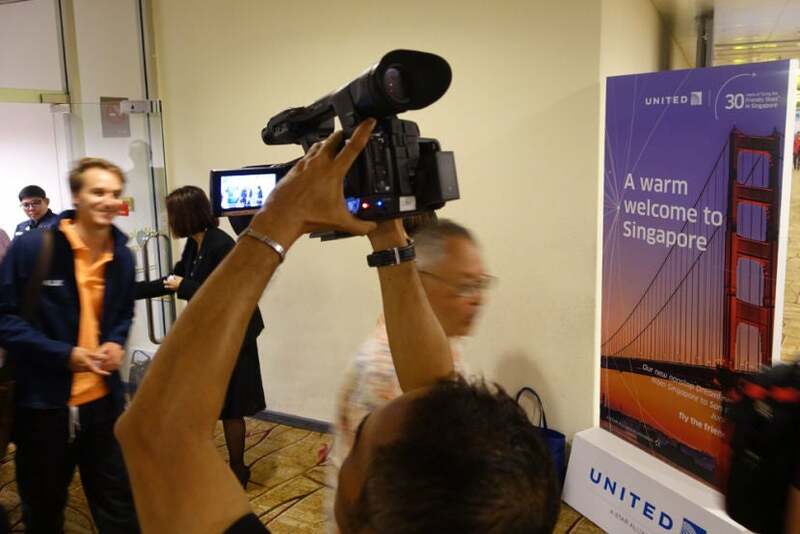 The excitement began as soon as I walked off the escalator, with passengers and United employees posing for pictures by the Singapore banners. There were some snacks at the gate, but I was stuffed from the Newark flight and the Centurion Lounge, so I walked right on by. 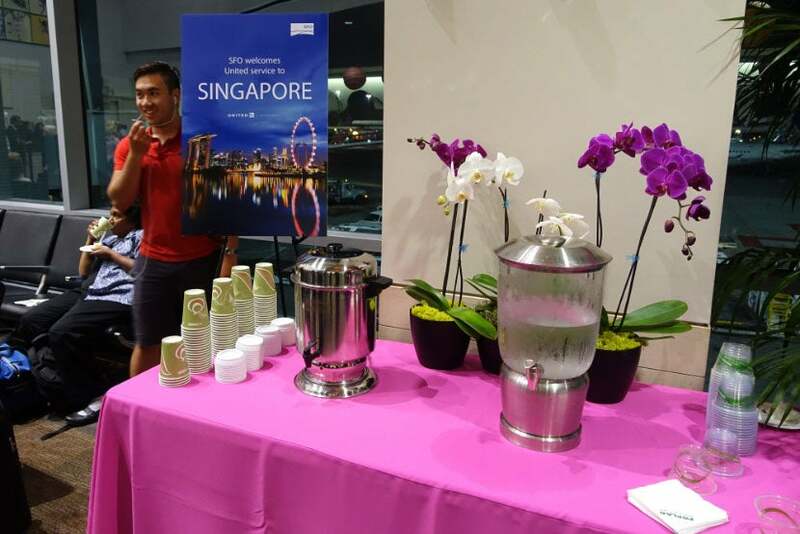 There was also coffee and water available — an open bar would have been nice, but what can ya do! 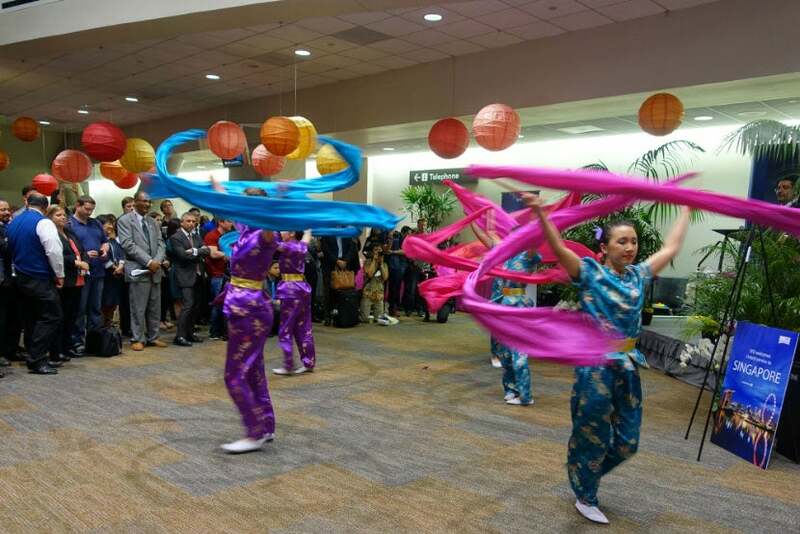 About 90 minutes before departure, the celebration began with a Chinese dance. Followed by a second Chinese dance. 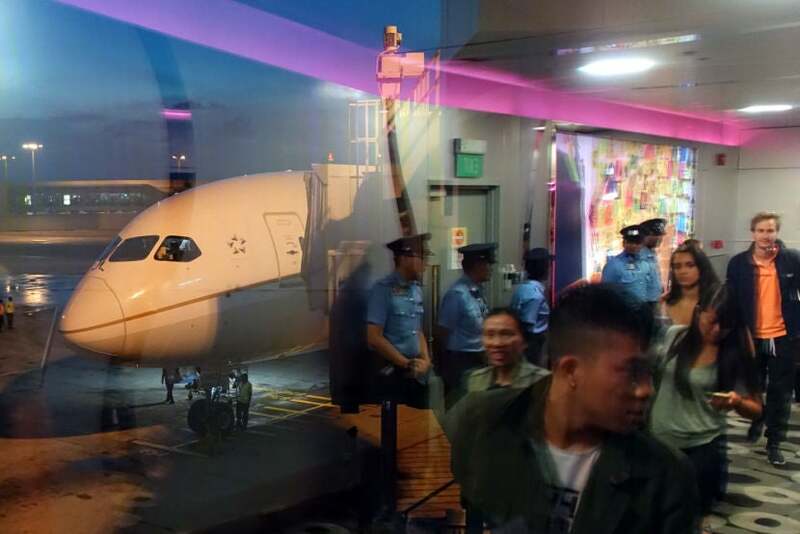 It was a full house, with a large group of passengers and staff gathered around the gate. And not your typical pre-departure group. 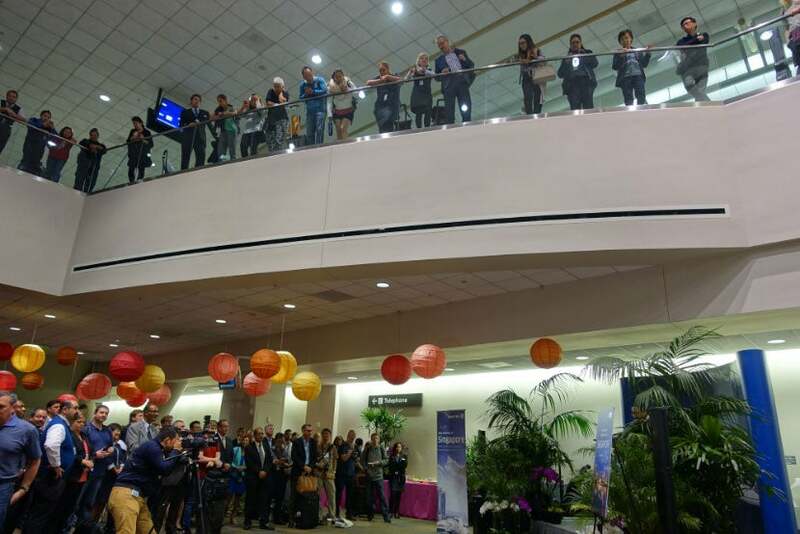 There were several VIP speakers, including United’s Chief Revenue Officer Jim Compton (the guy who controls whether or not you get a good deal on your flight). 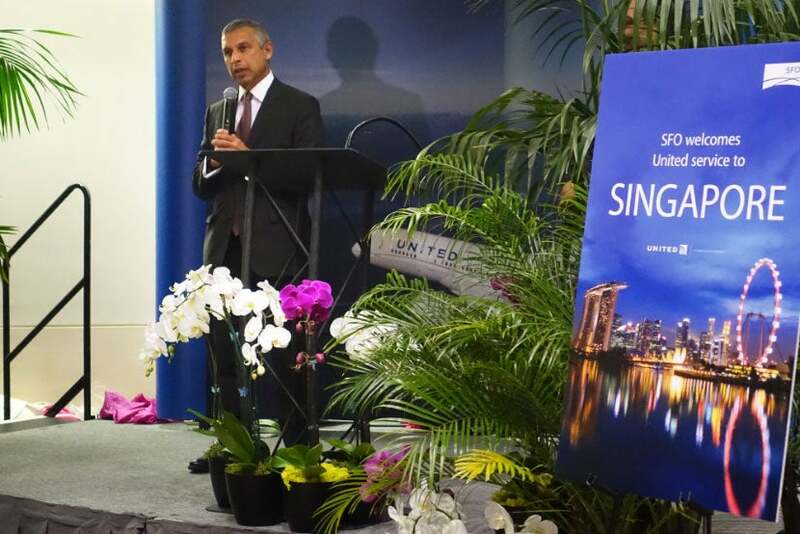 Singapore’s Ambassador to the USA was also on hand — he wasn’t on the flight, but I’m sure he’ll become very familiar with United’s Dreamliner over the next couple of years (until Singapore Airlines launches nonstop service in 2018). After a few speeches, the dignitaries lined up for a ribbon-cutting ceremony. 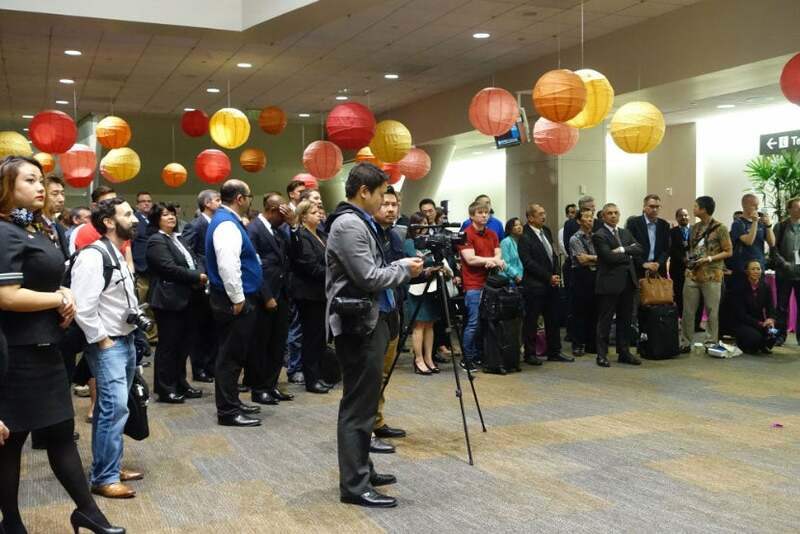 At which point all of the attendees pulled out their smartphones. And with that, the gate celebration was over. After the ribbon cutting, I had an opportunity to board early to snap some photos of the cabin. We boarded just before 10pm, for a 10:55pm departure. The 787-9 Dreamliner is noticeably longer than the 787-8, but it’s by no means gigantic. I could tell I was in for a treat before I even stepped on board. 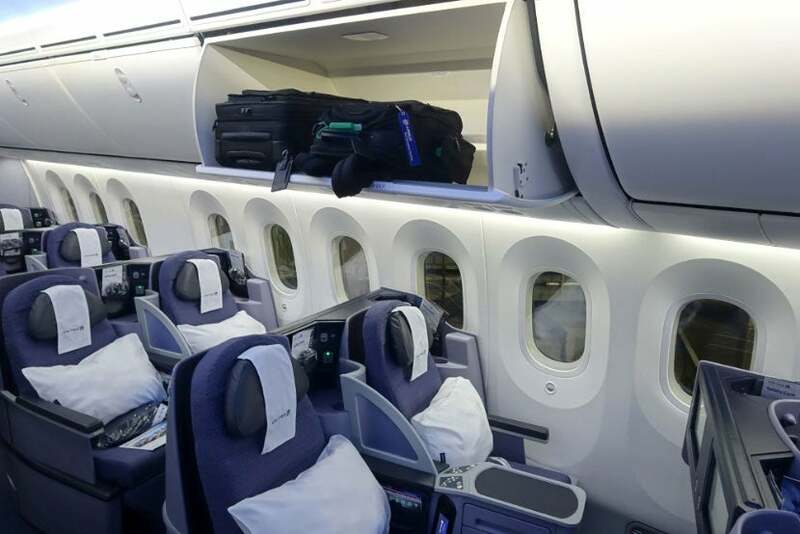 Passengers entered and deplaned from door 2, which features the Dreamliner’s signature lighted ceiling panels. 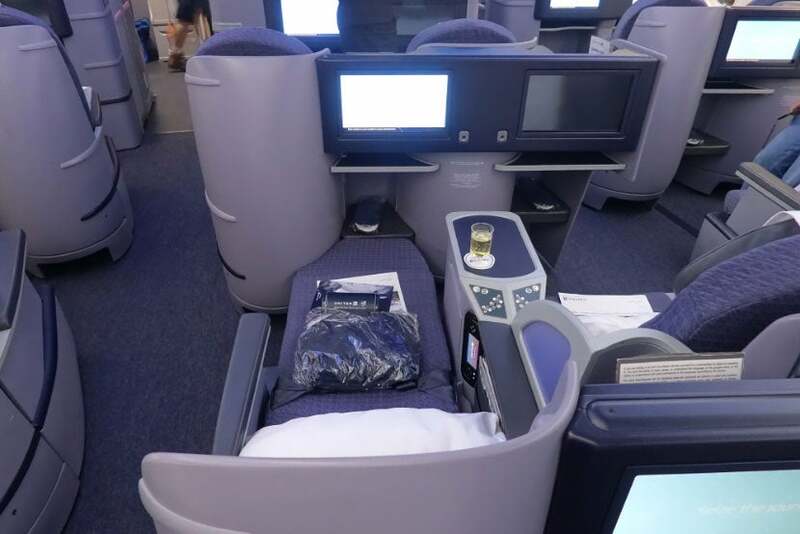 With just a couple of minutes before the rest of the passengers began boarding, I headed straight back to the second business-class cabin. 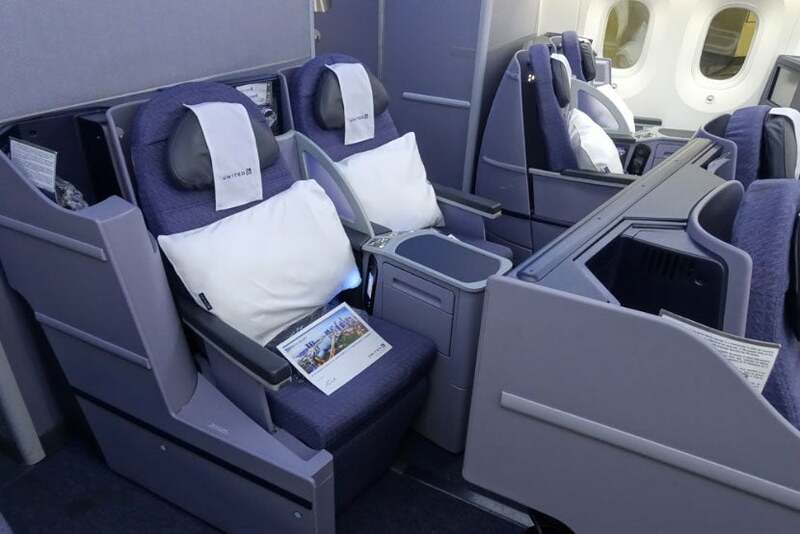 Both cabins have lie-flat BusinessFirst seats arranged in a 2-2-2 configuration. 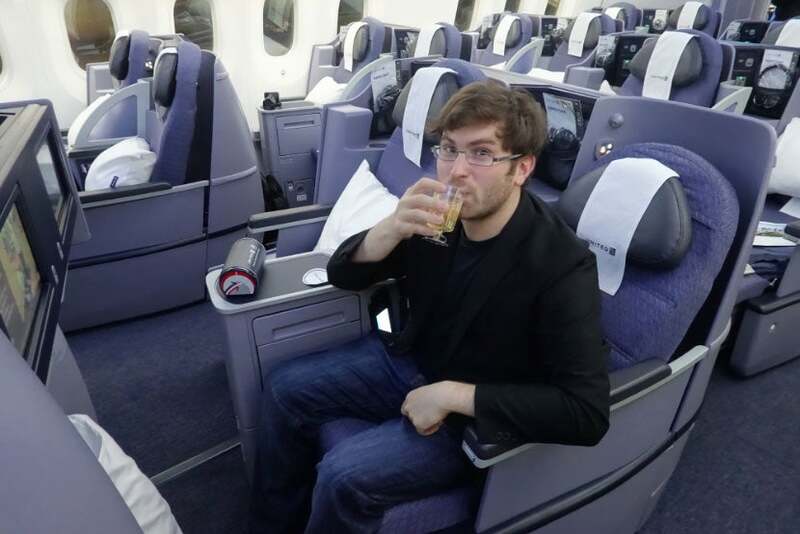 As you can see, there isn’t a ton of privacy, though I find United’s seats to be perfectly comfortable. 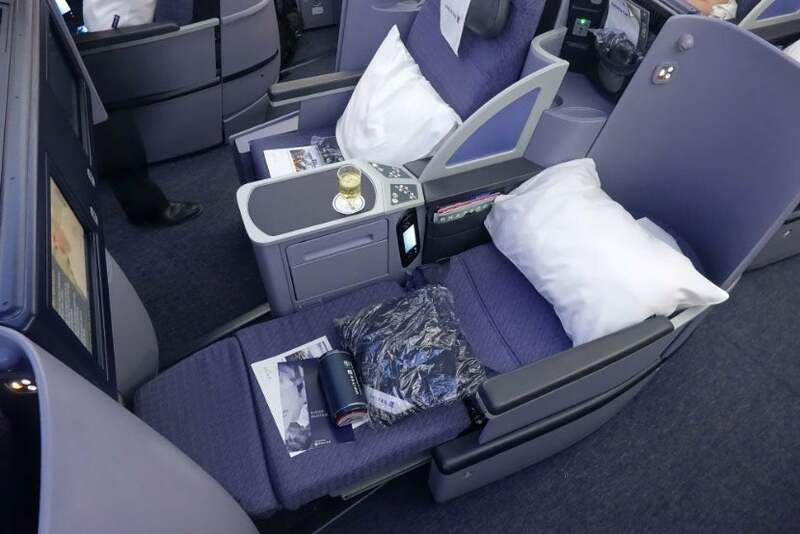 The airline’s new Polaris business class will represent a huge improvement, though it may be quite a while before we see those seats on a route like SFO-SIN. 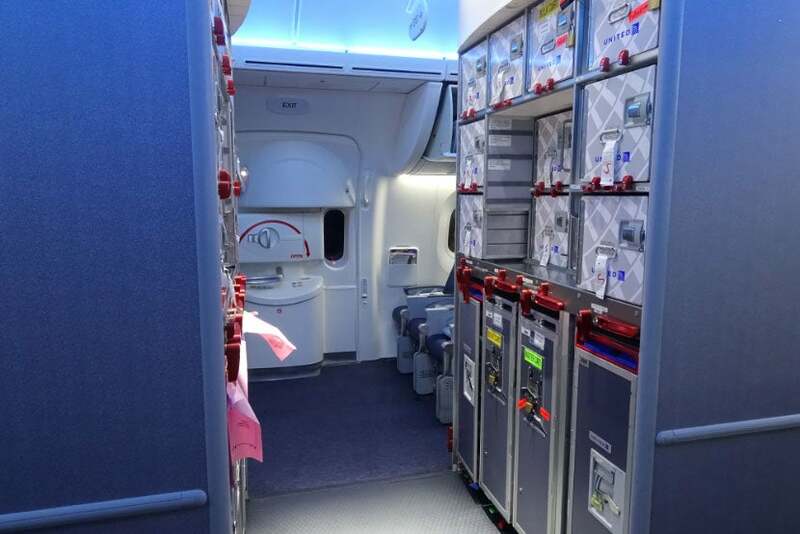 There are 18 seats in the smaller cabin, which is located behind door 2. 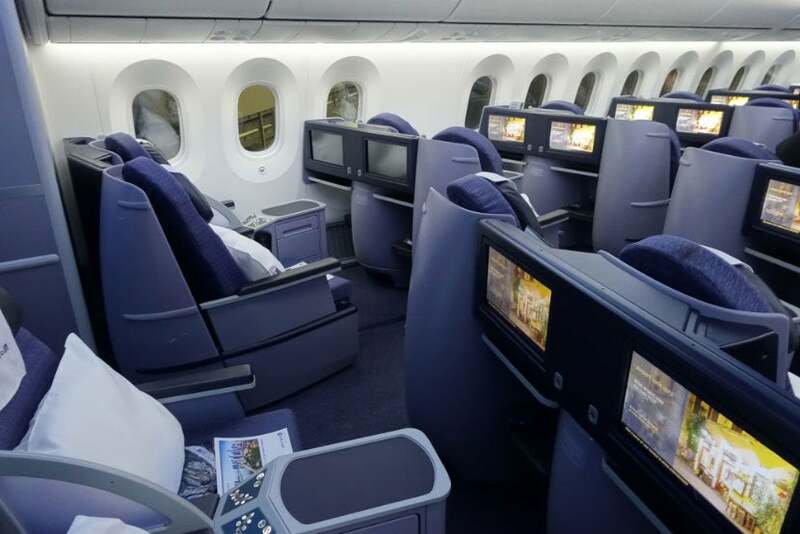 The BusinessFirst seats are all fairly consistent, though I much prefer a seat in the first row of the center section, which offers direct aisle access and a much larger footwell. Check out all that foot and storage space in the bulkhead row! 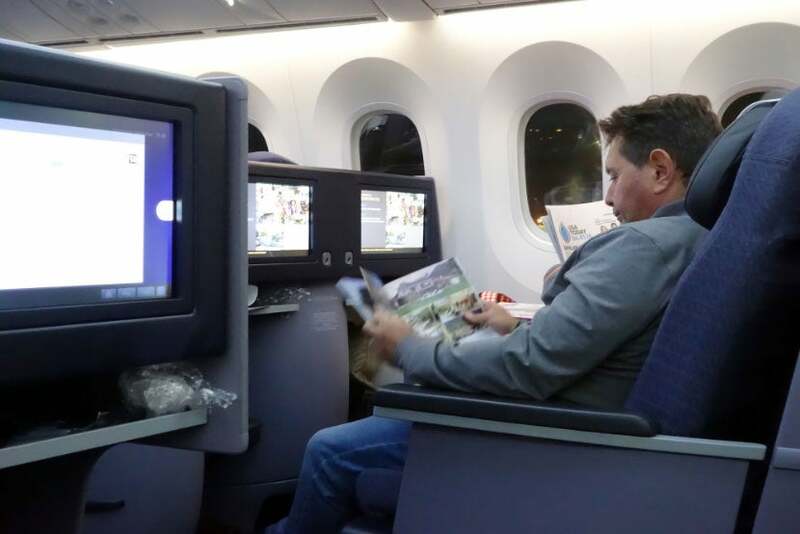 Each BusinessFirst seat has a 15.4-inch HD display with on-demand entertainment. 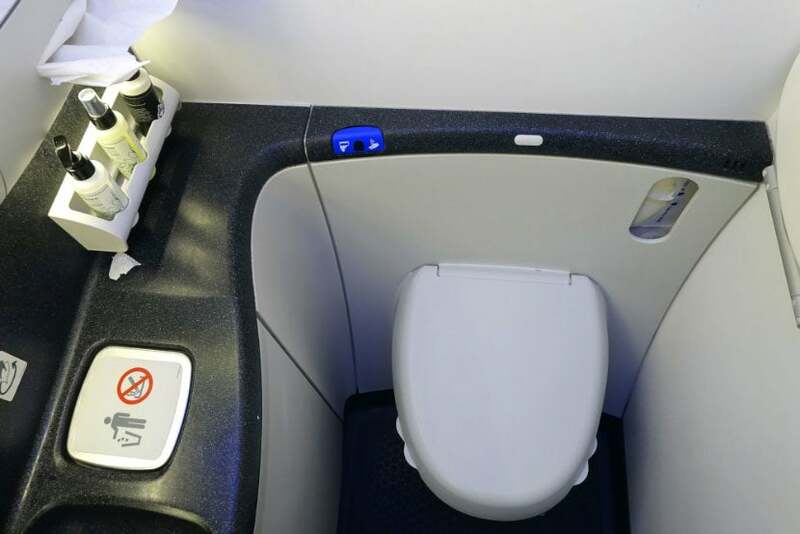 The seats are staggered by a couple of inches, which adds a bit of privacy. 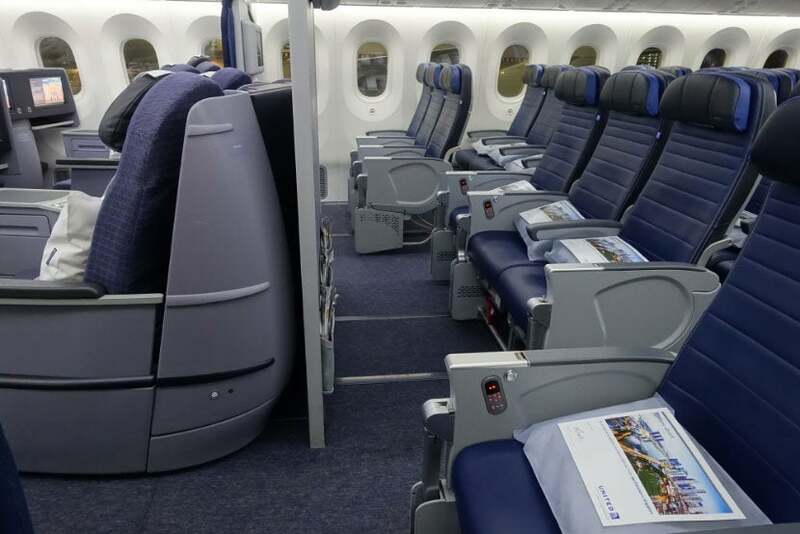 Moving on up, the forward business cabin consists of 30 seats, also arranged in a 2-2-2 config. 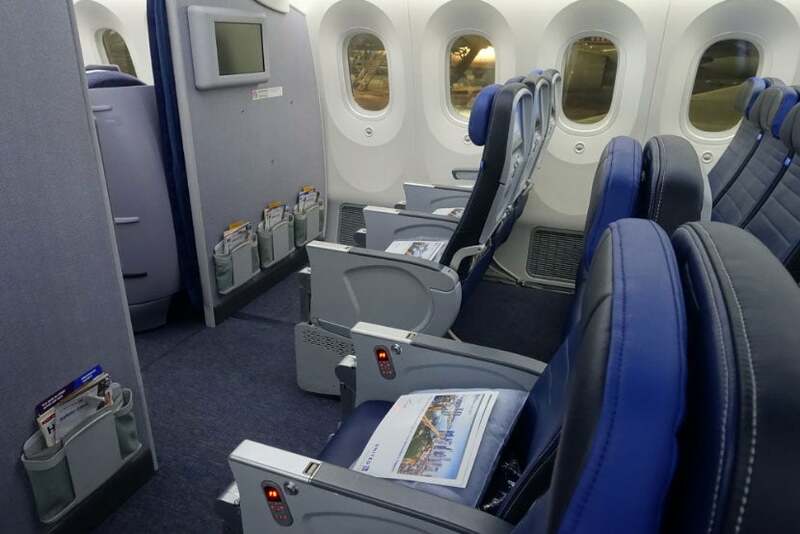 The main BusinessFirst cabin is quite a bit larger, with an extra two rows of seats. 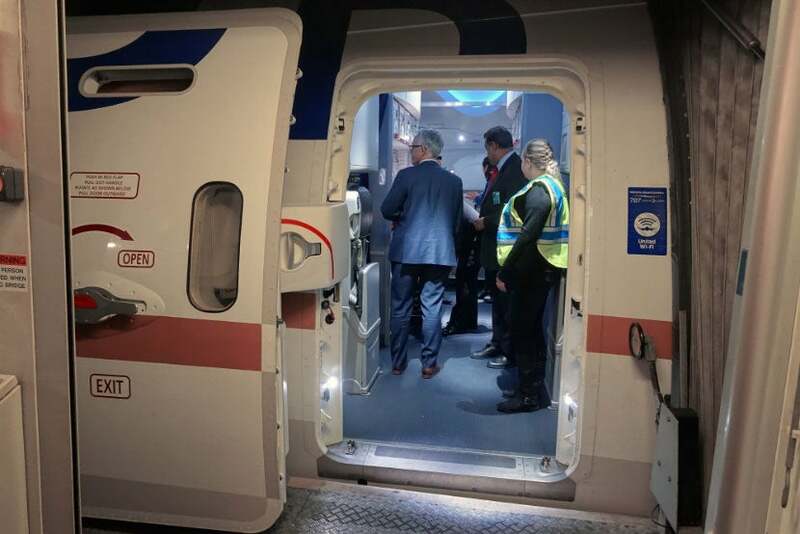 My guess is that the extra seats impact service a bit — I grabbed a seat in the smaller cabin for the flight home, so I’ll know for sure in just a couple of days. 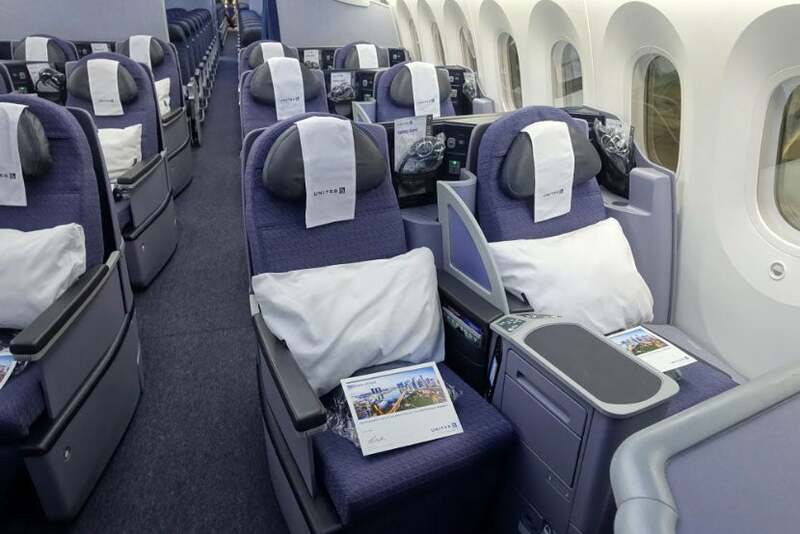 Each seat has a large pillow and comforter — you’ll typically get these even when flying the 787-9 on a domestic route. 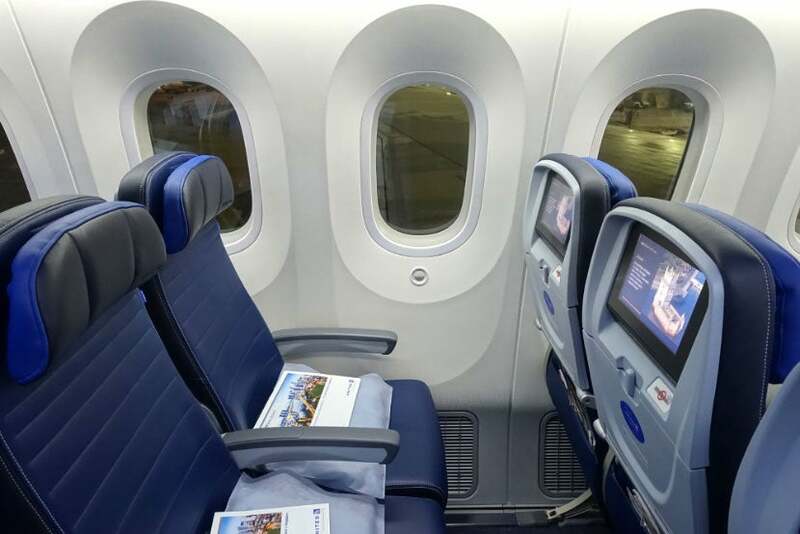 Window seats are great if you just plan to sleep (or look out the window), but it can be tricky to get out if the person next to you is fully reclined. 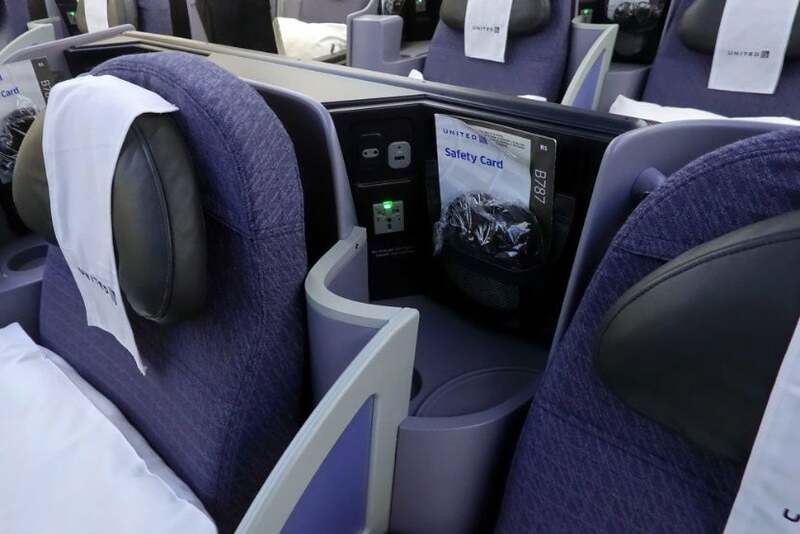 Business seats also offer a large center console, and fold-out tray tables. 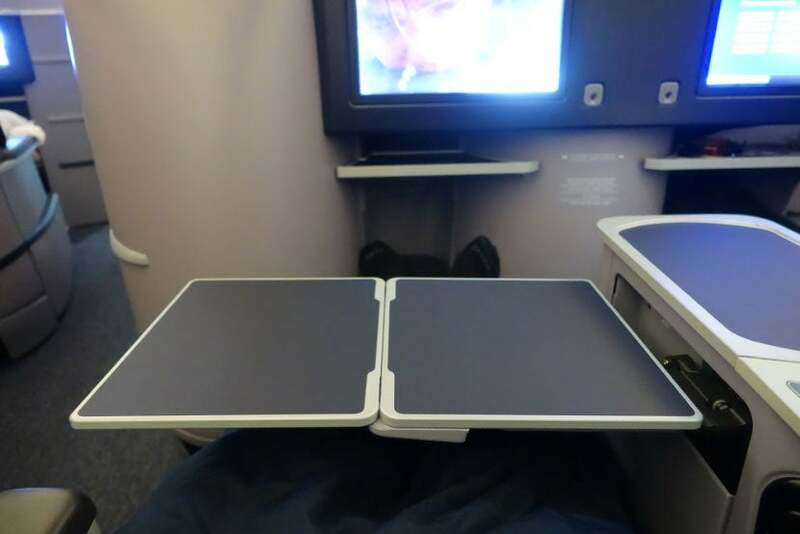 Here’s an extended tray table. 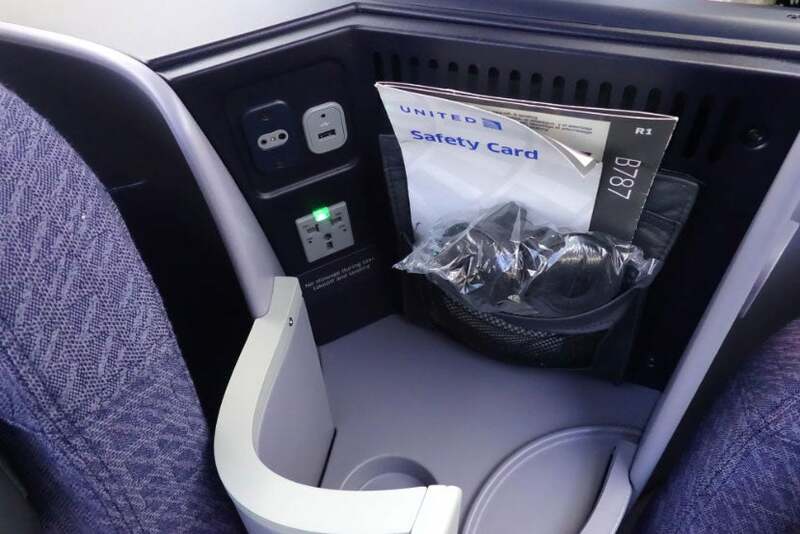 Each BusinessFirst seat has its own universal power outlet and USB charging port. Each seat also includes a pair of headphones, but they don’t sound fantastic — I’d recommend bringing your own. 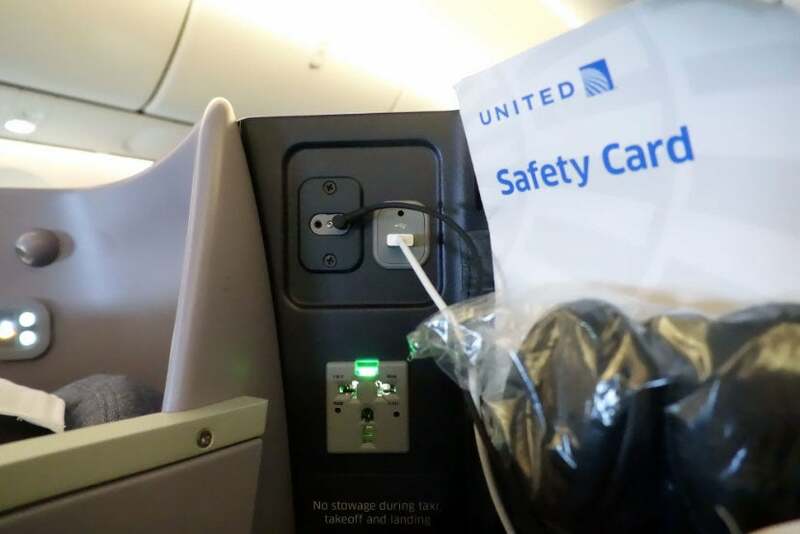 Passenger-supplied headphones work just fine, despite the dual-plug design. 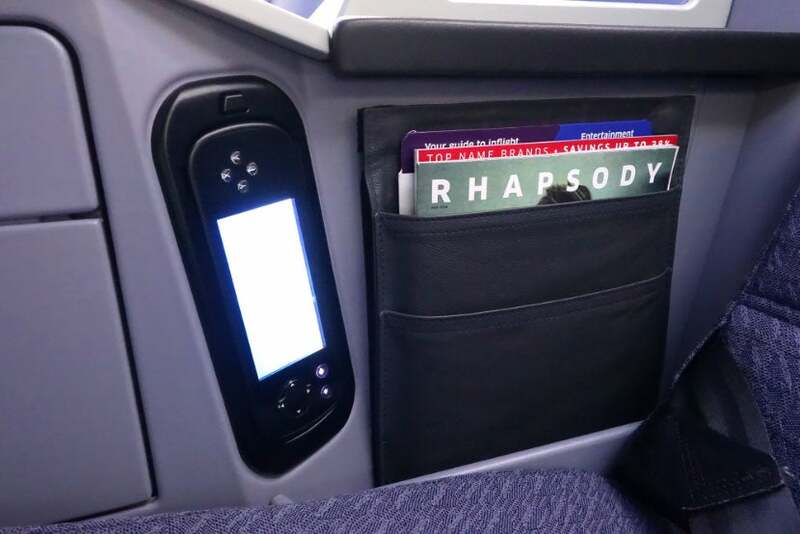 There’s also a magazine pocket and a (fairly buggy) touchscreen remote (exclusive to the 787-9). 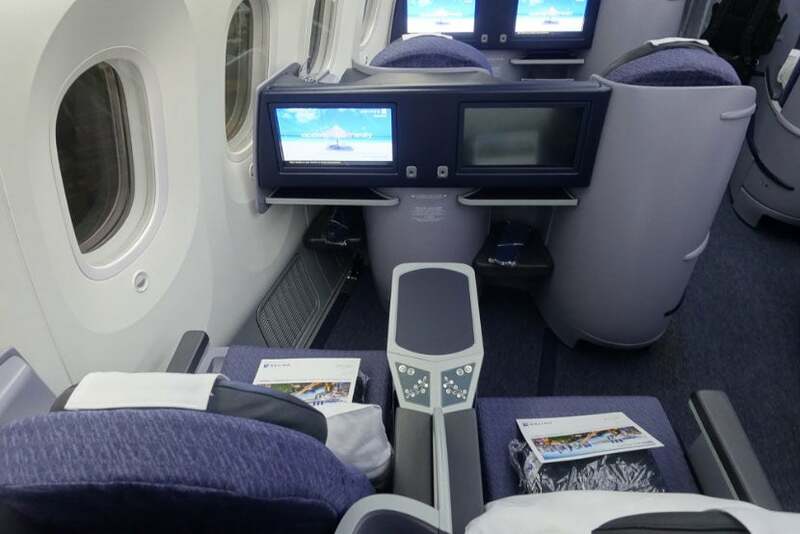 The seat controls are more intuitive than what you’ll find on some of United’s other planes with similar seats, including the 777-200 (except this configuration), the 767-400ER and international/p.s. 757-200. There are also overhead reading lights and vents (don’t underestimate the value of a dedicated air vent). The seats recline to a full-flat position — or anywhere in between. You can use the pillow to prop yourself up with the seat fully reclined, or you can angle the upper portion up a bit to watch TV. The leg rest extends all the way out to meet the small ottoman (again, these are much larger in bulkhead seats). The overhead bins are gigantic, with plenty of room for me to toss in my Tumi rolling bag any way I like. 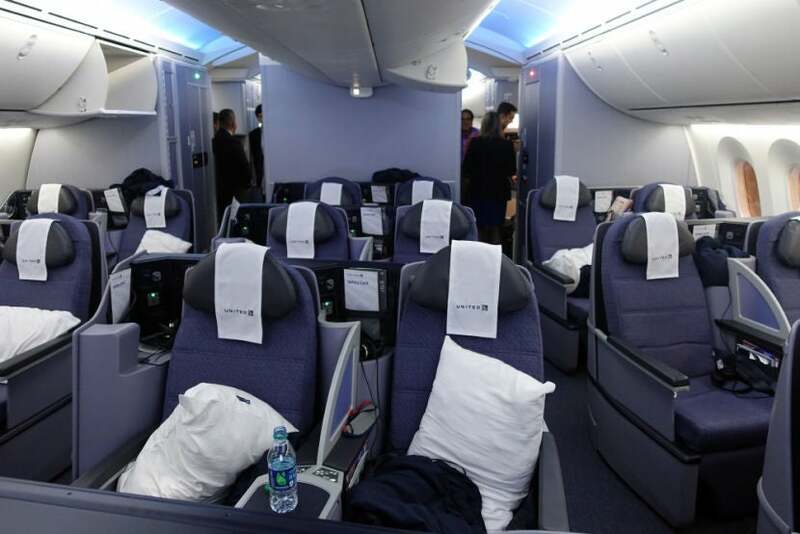 The first economy cabin is located just behind business class, separated by a thin curtain. 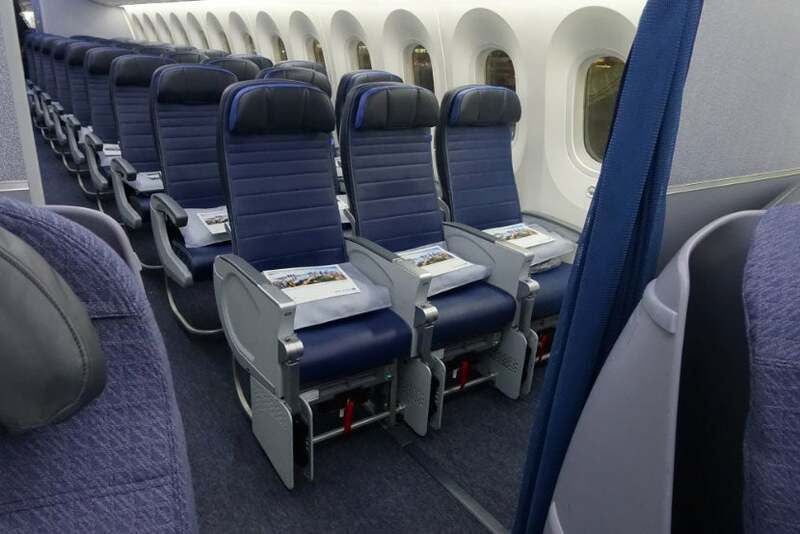 Seats in rows 16 (pictured above) and 27 offer much more legroom, but the armrests are fixed in place, making the seats a bit narrower than those behind. 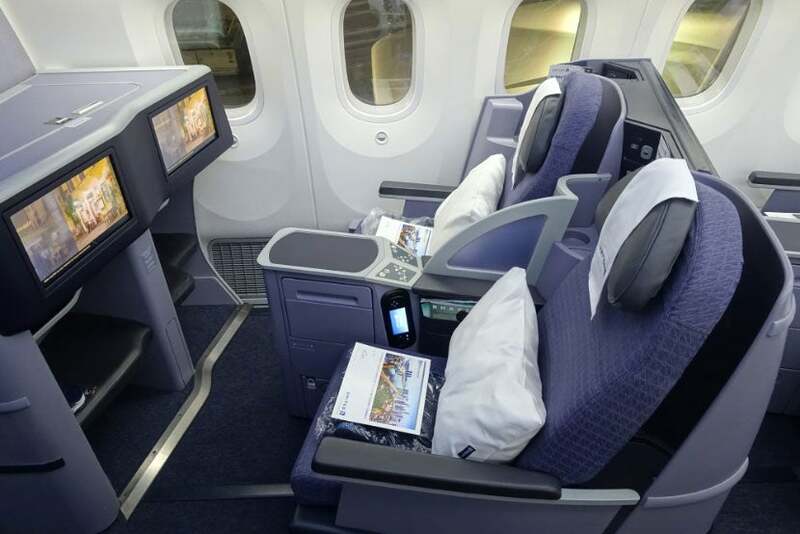 Row 16 is Economy Plus, so you’ll pay a bit more for those seats if you don’t have status, but on a 16-hour flight the additional cost is probably worth it. 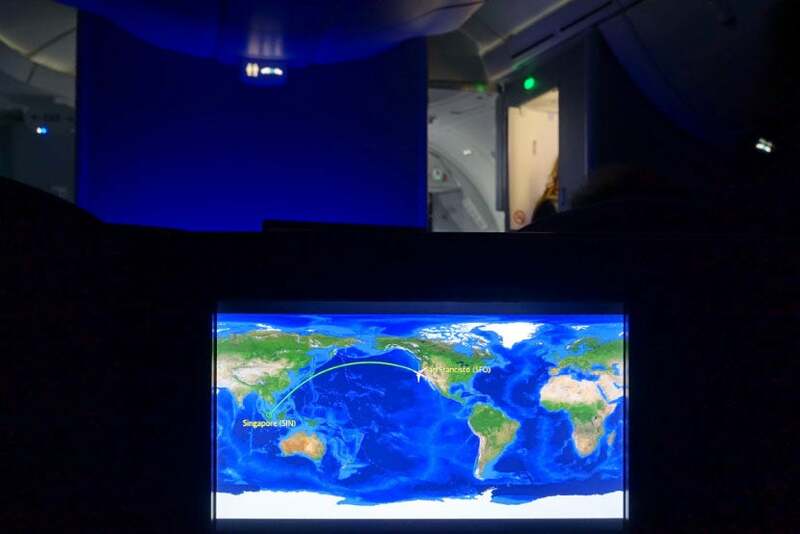 Bulkhead seats also have a clear view of the moving map throughout the flight. 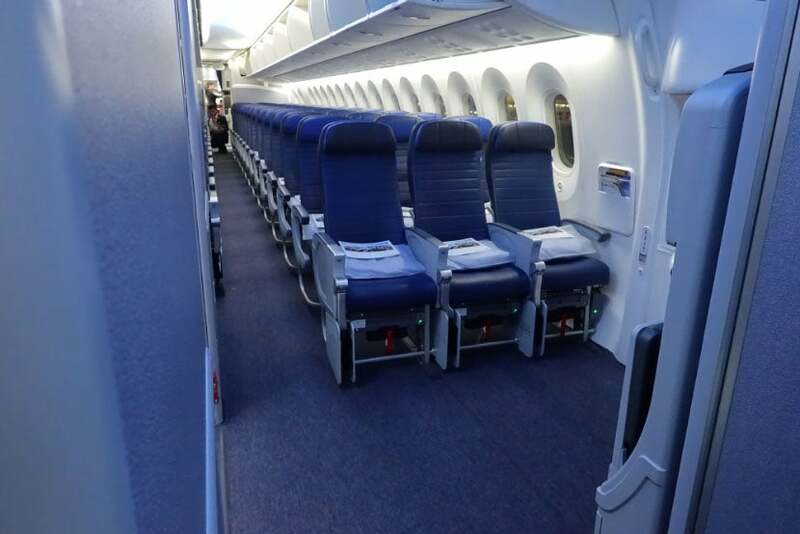 All economy seats on this plane are arranged in a 3-3-3 configuration. 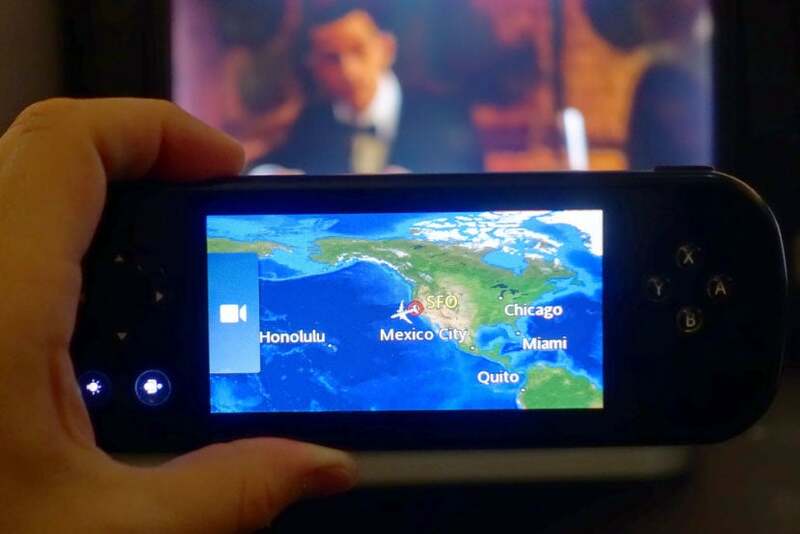 Economy seats have the same entertainment options that you’ll find in biz, albeit with a significantly smaller screen. 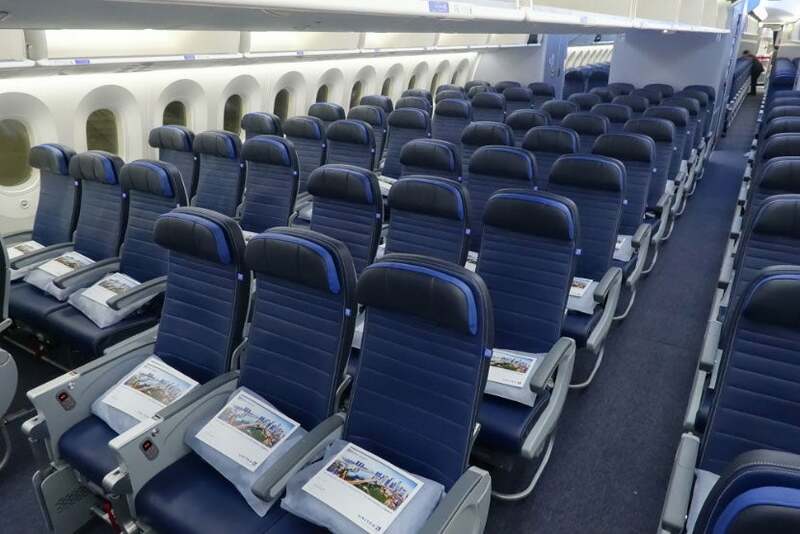 Economy Plus seats (pictured here) offer a bit more legroom. 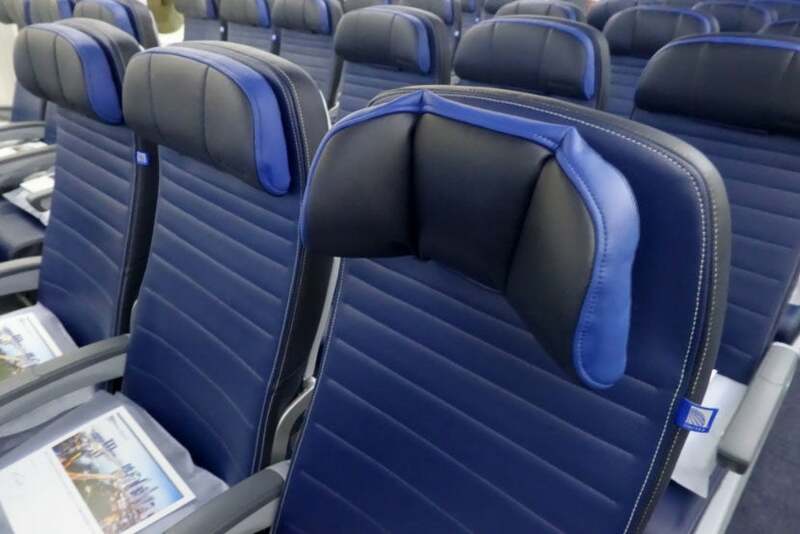 All economy seats offer adjustable headrests, which make for more comfortable sleep. 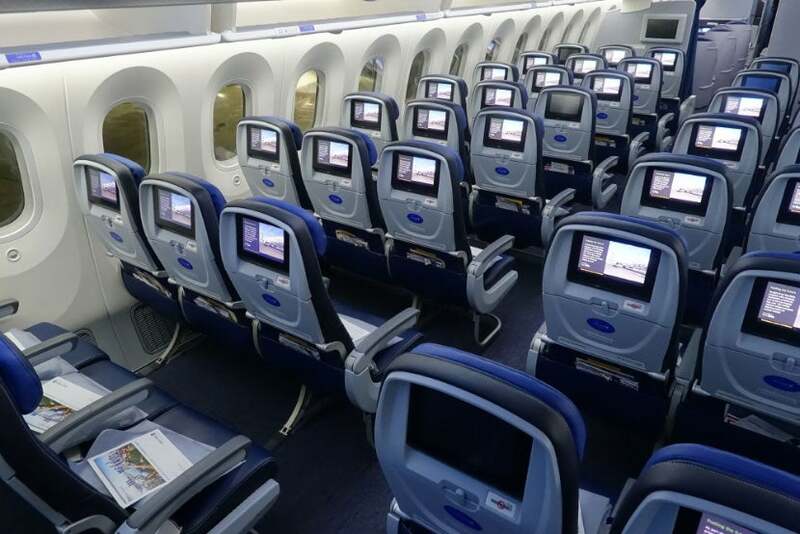 While it’s definitely a hassle when you need to get up, window seats have direct access to the Dreamliner’s huge dimmable windows. 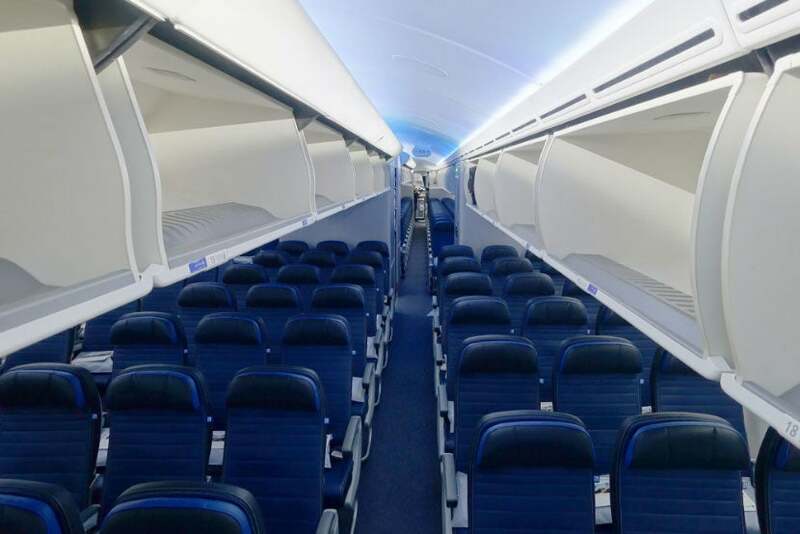 Row 27 (at the front of the second economy cabin) is your best bet for legroom, but you don’t have much access to the window there. As you can see with 27JKL, there’s enough room to pitch a tent (the FAA forbids this, unfortunately). 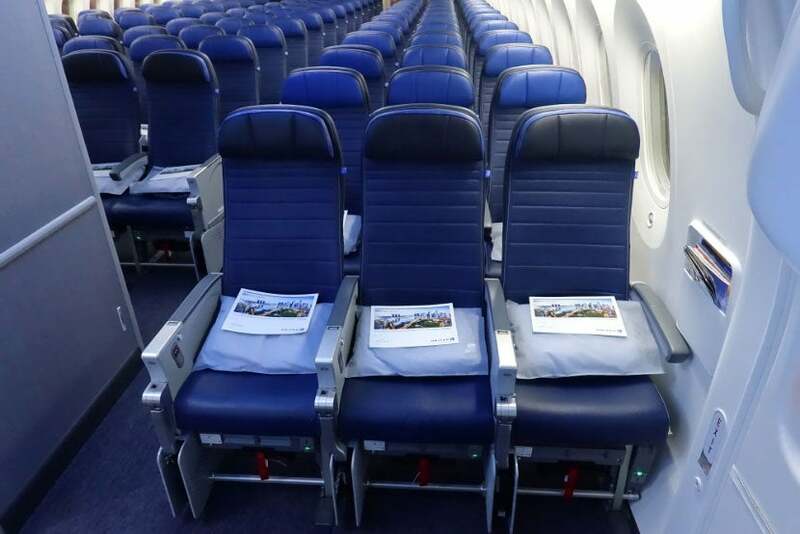 An inaugural flight certificate was waiting at each seat. 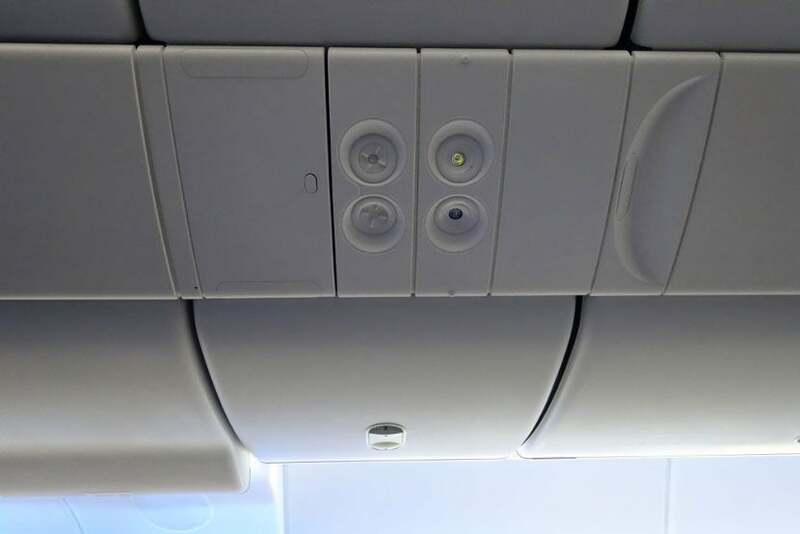 With larger overhead bins, there should be enough space for every passenger to keep their bags with them during the flight. 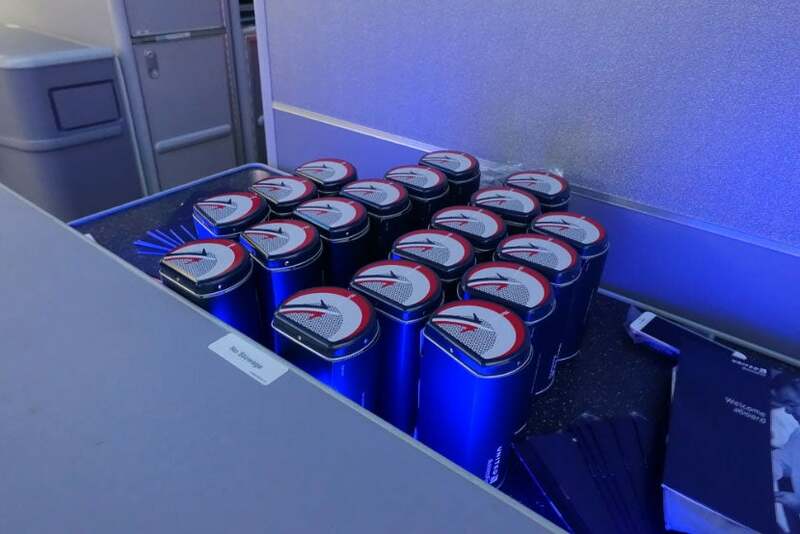 United just launched brand new amenity tins in celebration of the 2016 Summer Olympics, and those happened to be available on our flight. 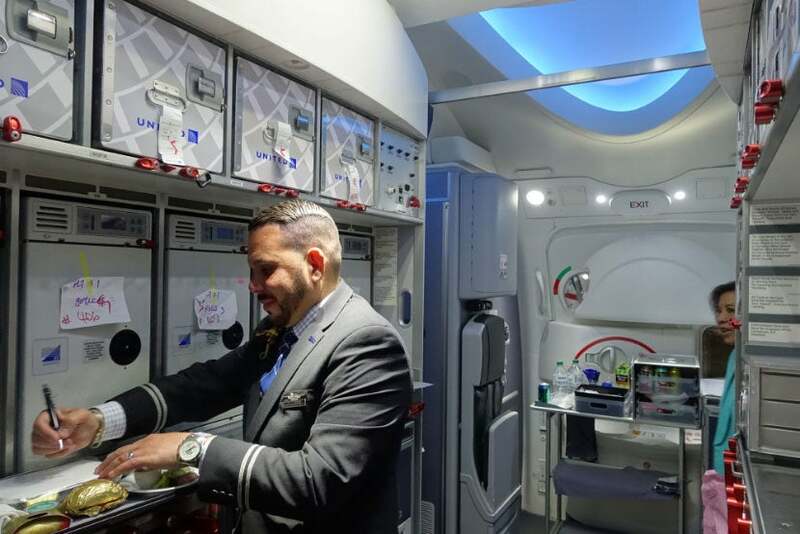 Flight attendants walked over to each passenger with an amenity kit and menu shortly after boarding. 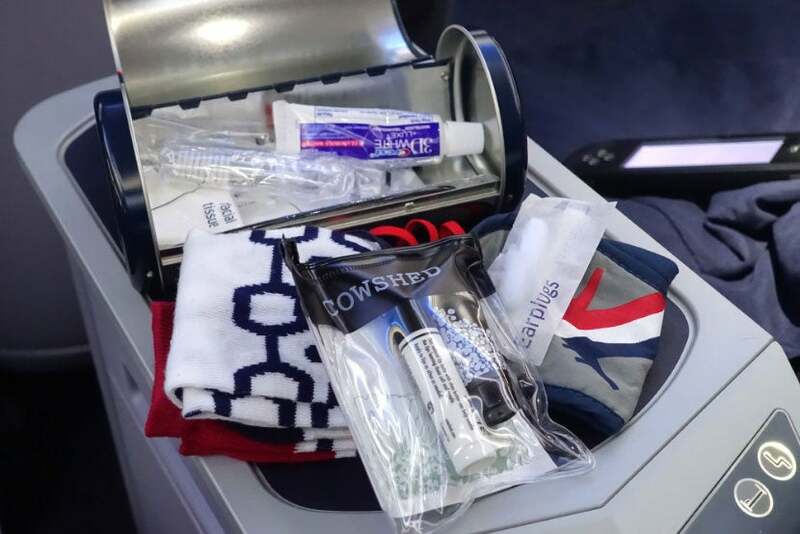 Each kit includes a toothbrush, toothpaste, eye mask, ear plugs, socks, moisturizer and other products. 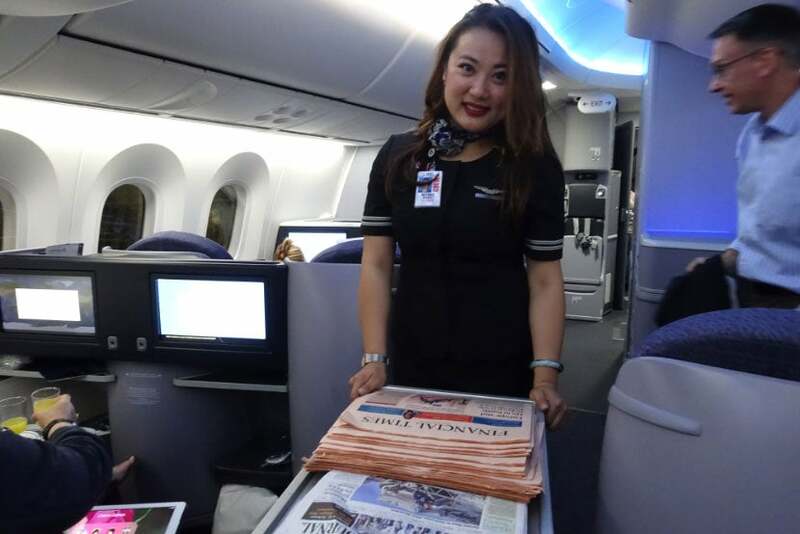 Once most of the passengers had boarded, a flight attendant came by with newspapers. I didn’t take a paper, but apparently they’re a hit. Wait, that was a magazine (or a real estate brochure or something) — this is a newspaper. 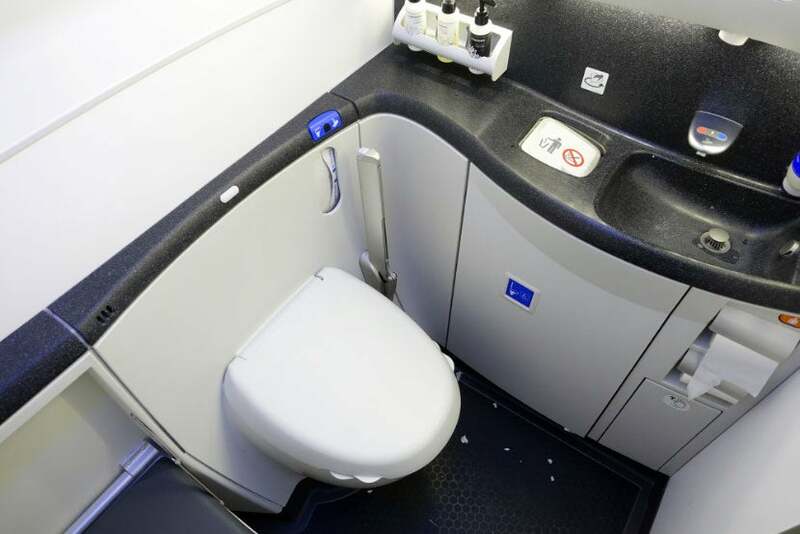 The lavatories are fairly compact, but they feature touchless sinks, which is a huge plus. The toilets are touchless as well. The lav just past the main entrance door is by far the largest on board, so I’d pick that one if it’s available. 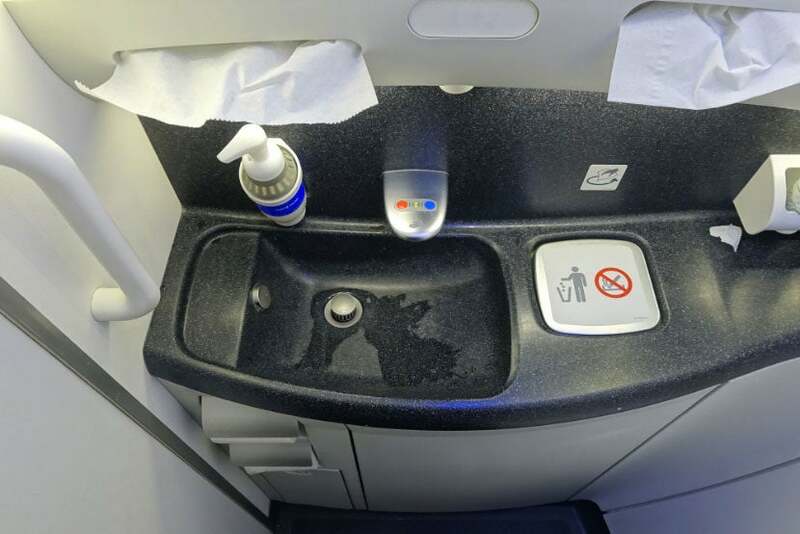 United doesn’t do much to keep the lavs tidy during the flight — by breakfast time, this lav was filthy, with just a thin roll of toilet paper left (which was sitting on the counter). 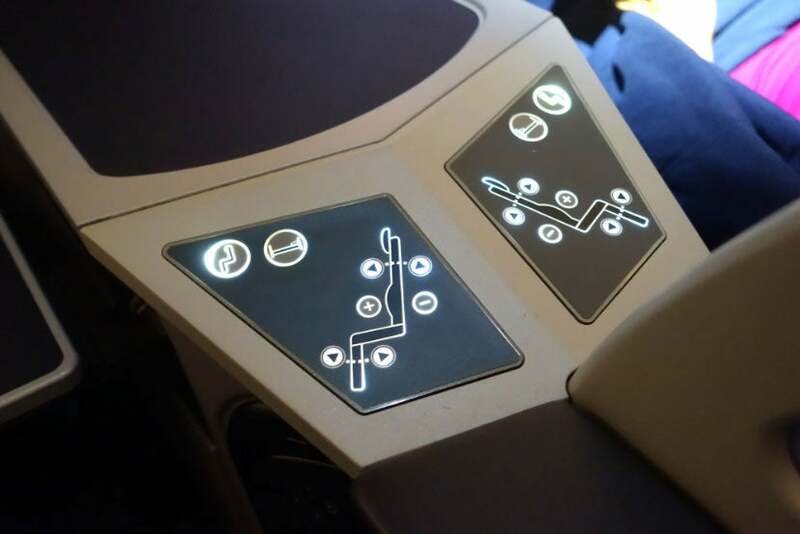 Each biz seat has a 15.4-inch touchscreen display. 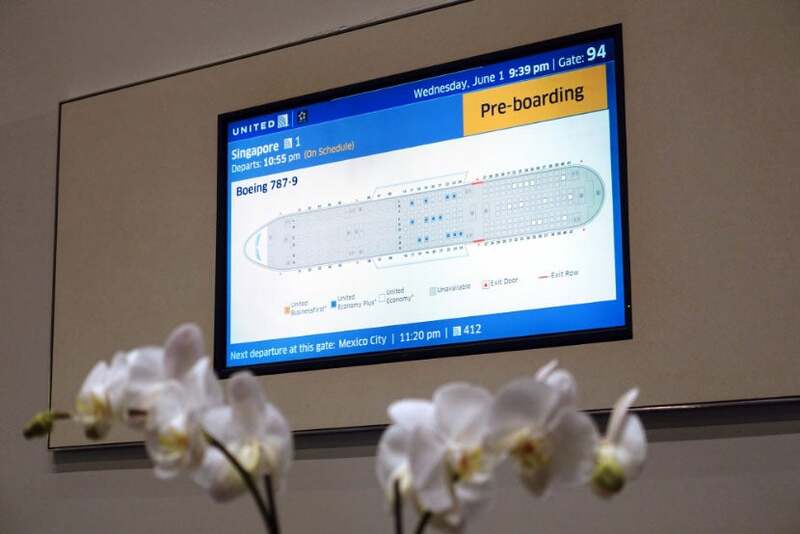 While some United planes have privacy filters on the displays, that isn’t the case with the 787-9. It’s not a huge deal, but definitely worth pointing out. 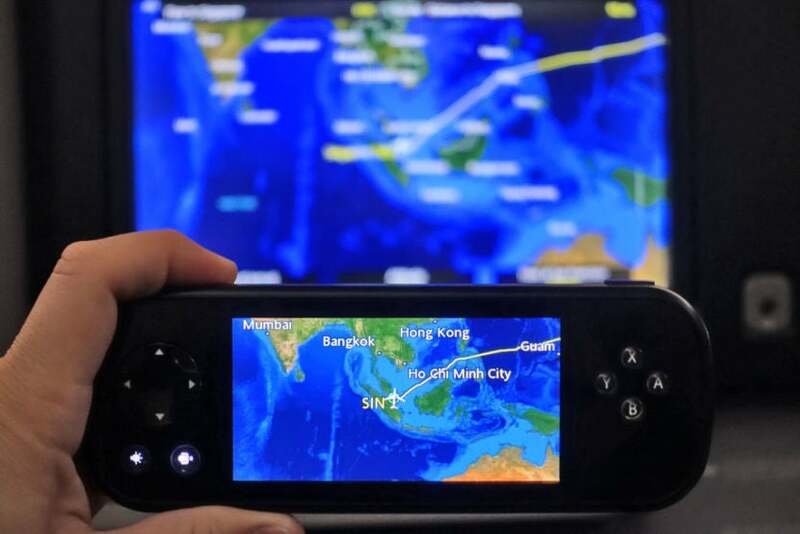 The handheld remote is pretty slick, with an option to display a moving map. 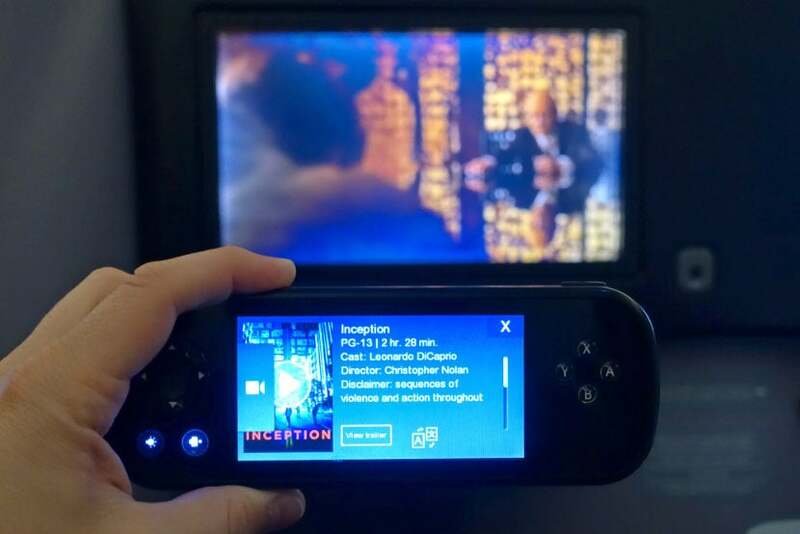 You can make your entertainment selection using the touchscreen remote. Interestingly, my p.s. 757 earlier in the day had more recent content available — the Dreamliner still had May’s selection, so I opted for an older flick. 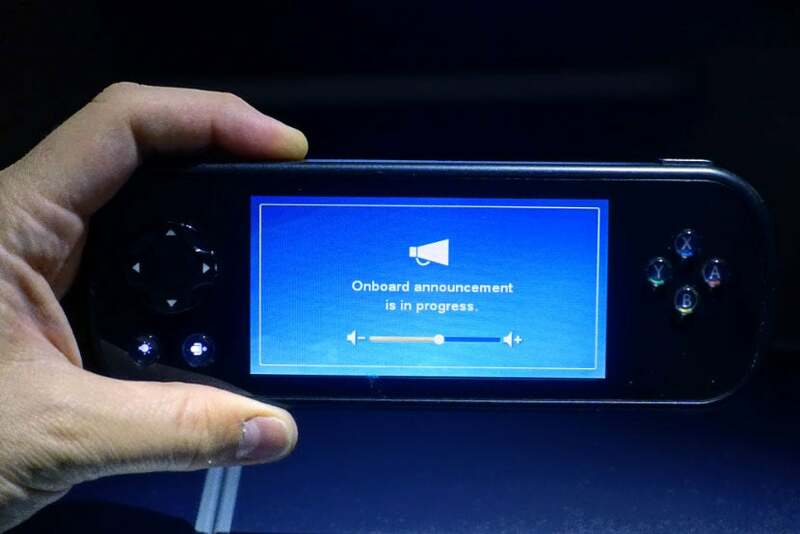 The handheld remote locks up during in-flight announcements — it also tends to freeze from time to time (my seatmate’s didn’t work during the entire flight). 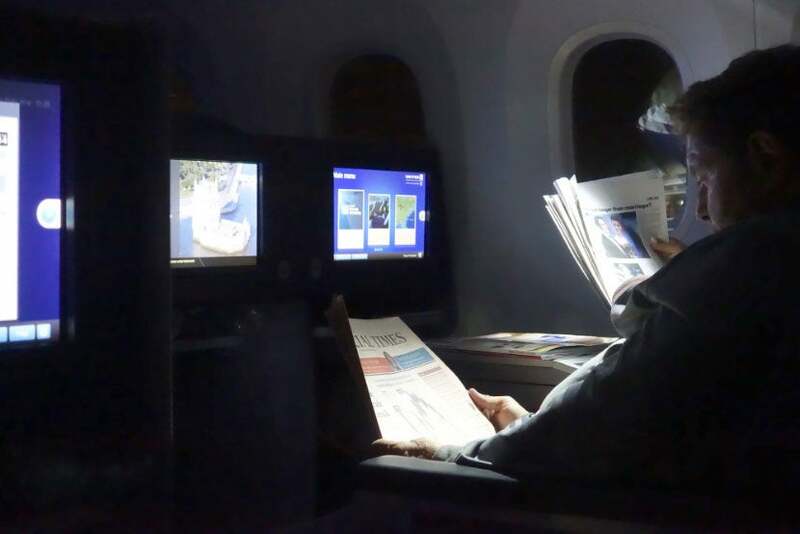 I’d say roughly half of the passengers in my cabin were watching content at any given time during the flight, which added a bit of light. 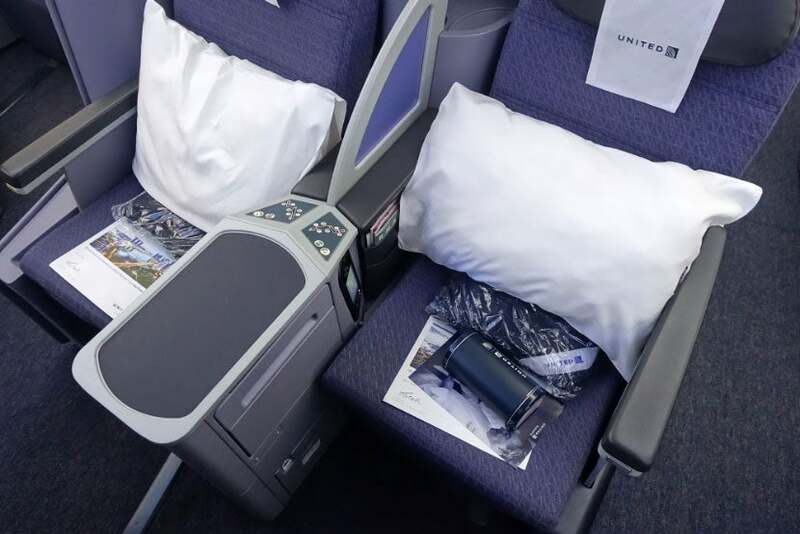 Fortunately, United’s amenity kits include eye masks, which you’ll probably want to use whenever you’re hoping to catch some shut-eye. I began the flight with some pre-departure sparkling wine. There’s plenty of mid-tier liquor (Tito’s vodka, Jack Daniel’s), beer (Heineken, Goose IPA) and wine (it varies from flight to flight, but there’s generally nothing to get excited about) to choose from, but this sparkling wine was the only alcoholic beverage I had during the 16-hour flight. 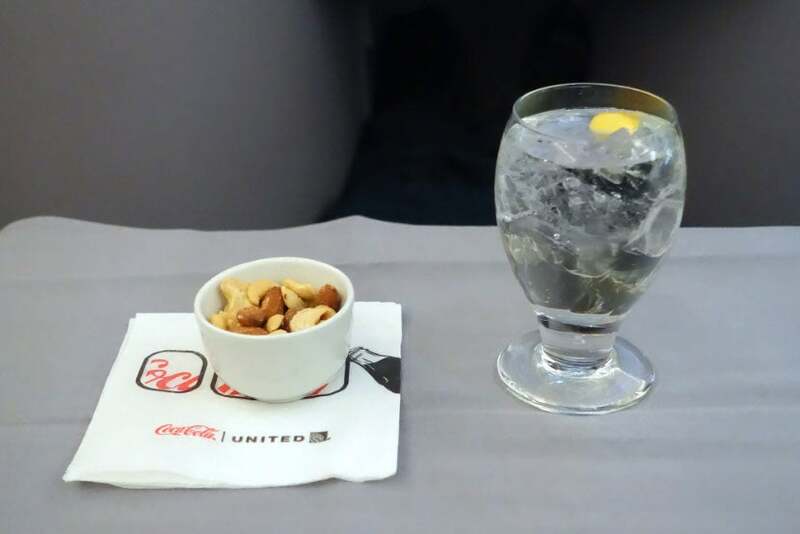 After takeoff, I requested a Moscow mule, but United apparently only stocks those on domestic flights. I had a sparkling water instead, which wasn’t refilled as often as I would have liked. 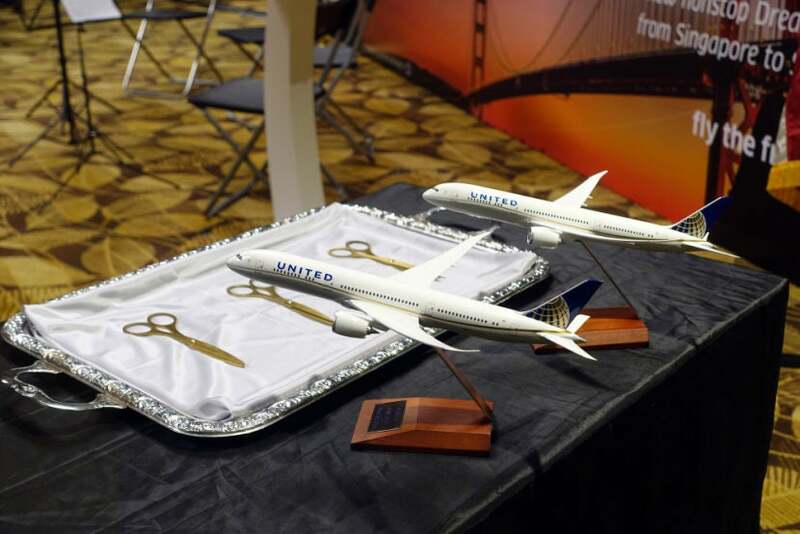 Given that this was a very special inaugural flight, I figured United might offer a very special one-time menu. 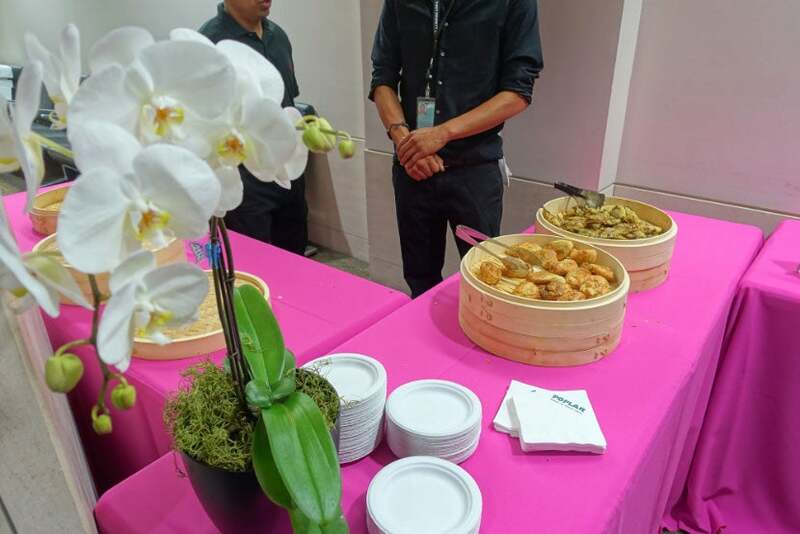 Instead, it was just the airline’s regular offerings which, while perfectly edible, aren’t exactly award-winning. 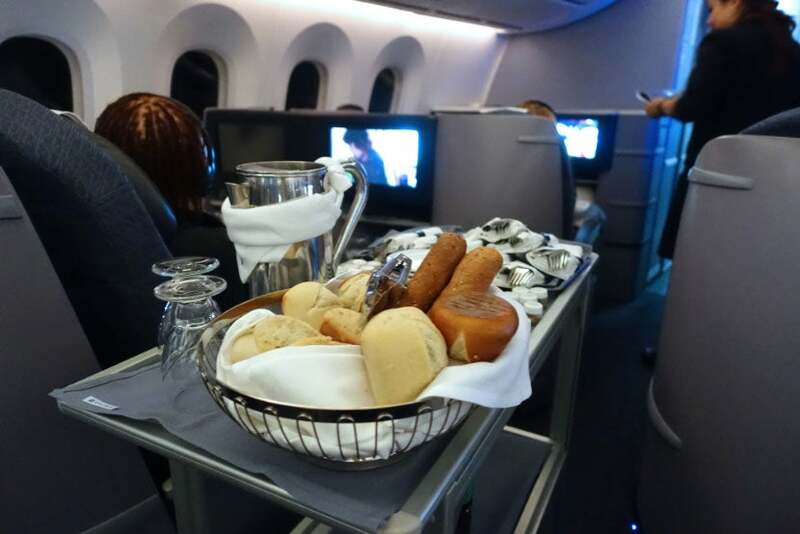 The main meal service began a few minutes after takeoff, with flight attendants rolling a cart through the aisle with place settings and a bread basket. I chose my usual — pretzel bread — which wasn’t nearly as warm or soft as the roll I had on my p.s. flight departing earlier in the day from Newark. 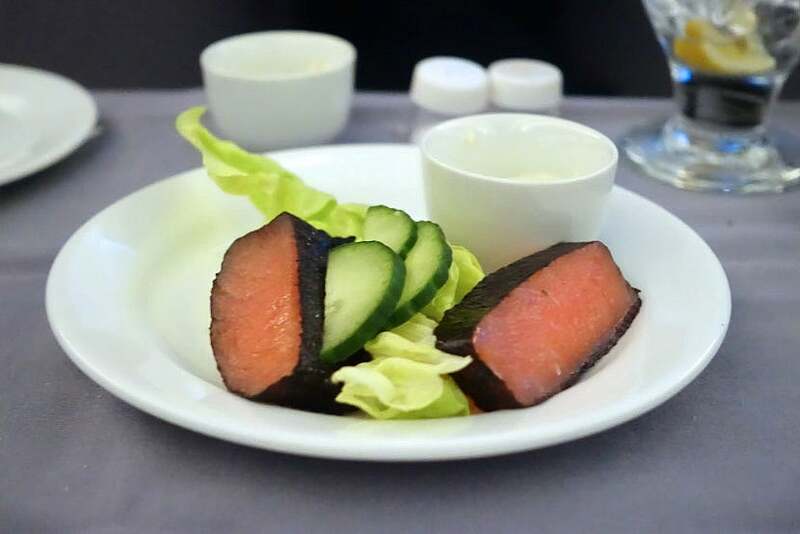 The nori-wrapped salmon was delicious, especially when dipped in the wasabi mayo. 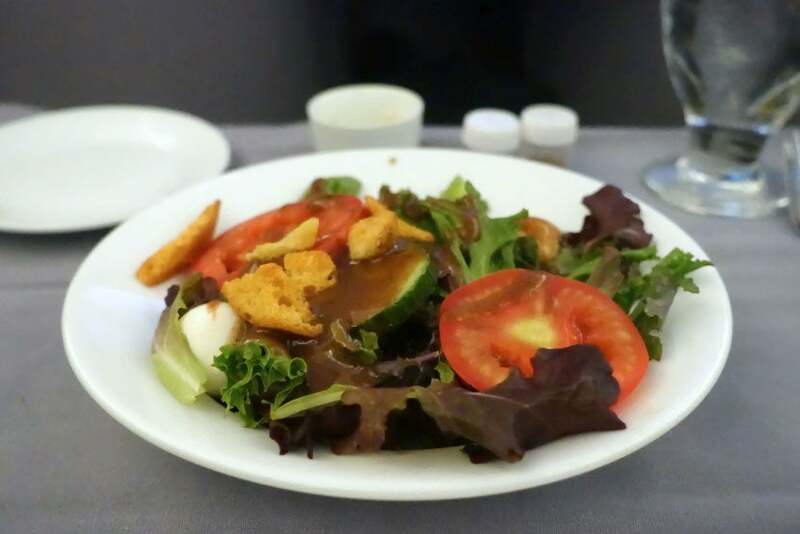 That was followed by a made-to-order salad, consisting of lettuce, tomato, cucumber, olives, mozzarella, croutons and a choice of gorgonzola or balsamic dressing. It tasted fresh, and the dressing was delicious. For my main course, my first choice was the seafood stir-fry — and that’s what I got. Everything on the plate was lukewarm, and the seafood itself was bland (though the sauce helped with that). I decided to skip the cheese and ice cream courses, since I was stuffed at this point. 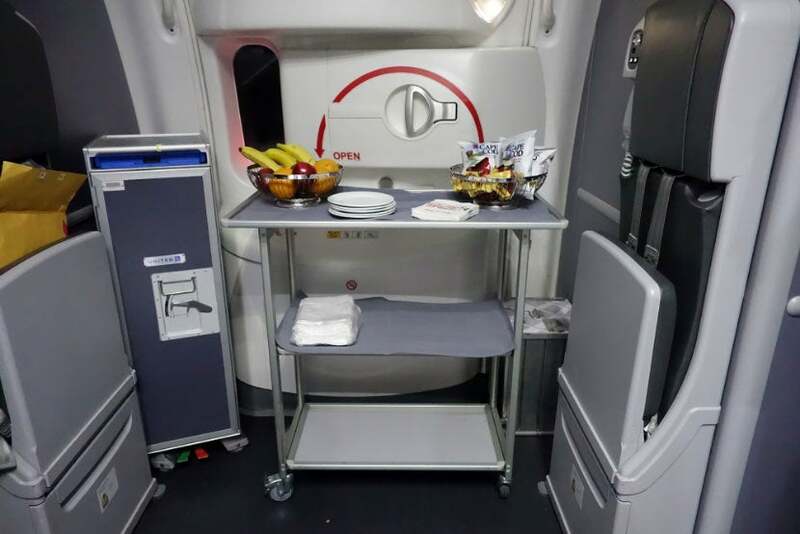 During the flight, there’s a selection of fresh fruit and snacks in the galley. 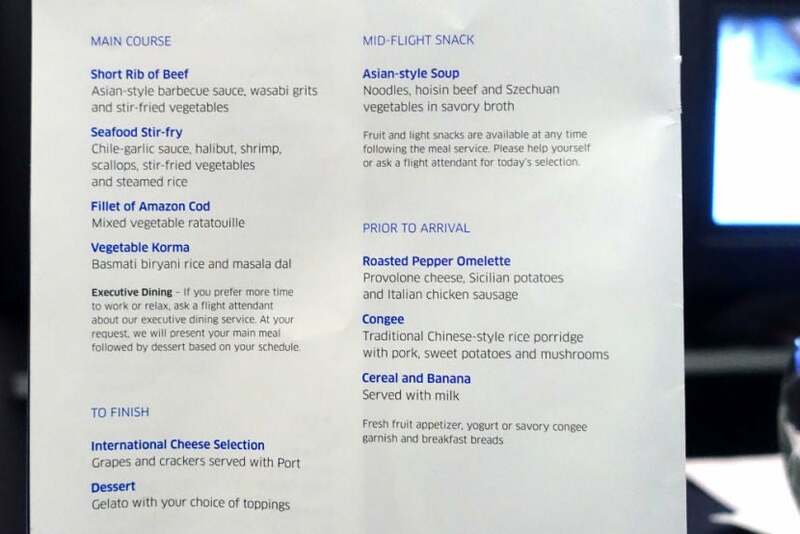 It isn’t quite as diverse a selection as AA offers at its 777-300ER bar, but it does the trick if you’re starving between courses. 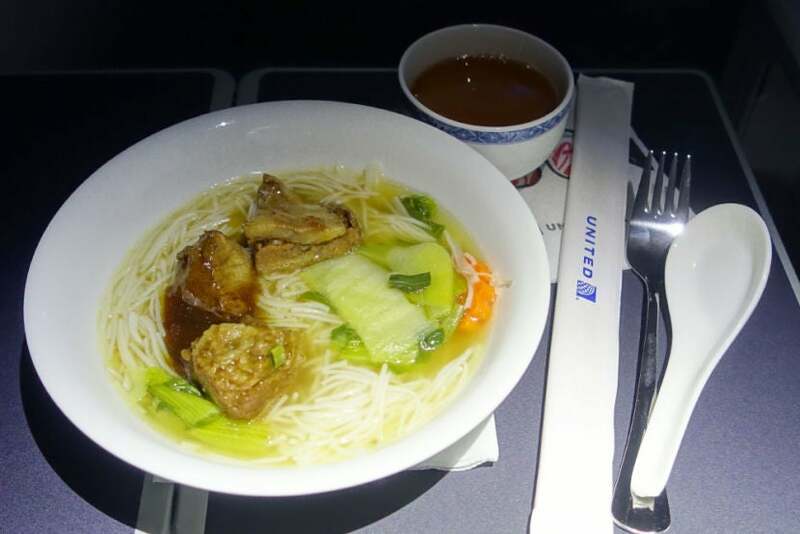 As we approached our halfway point somewhere between Honolulu and Guam, the flight attendants came through offering a second meal (an “Asian-style” soup with beef and noodles) to anyone who was awake. The soup was hot and delicious — it definitely hit the spot. 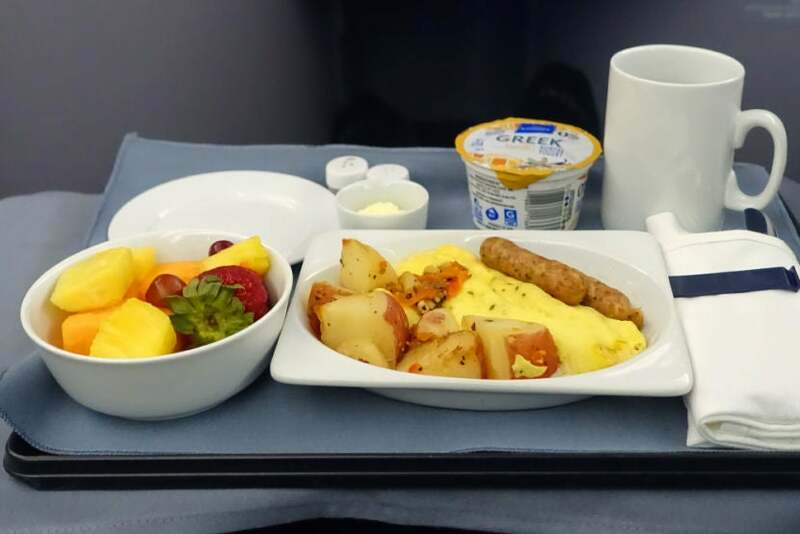 Then, about 90 minutes before landing, breakfast was served. 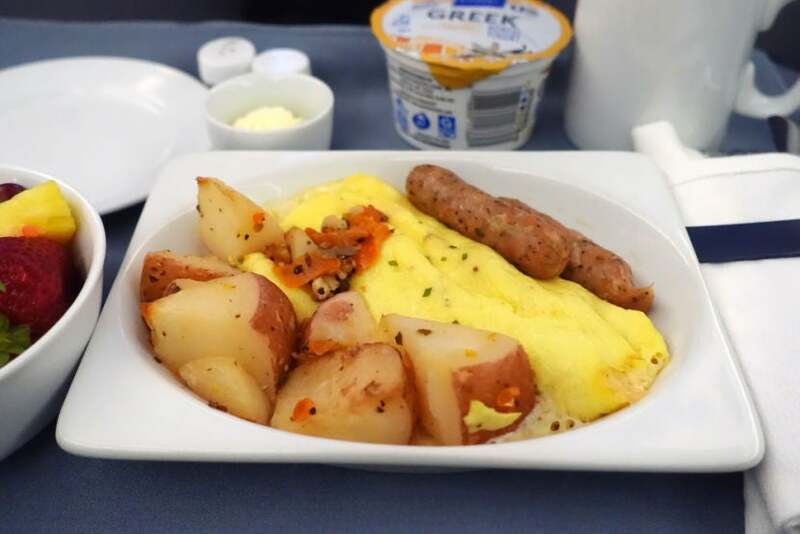 I opted for the eggs — the omelette itself was fairly flavorful, as was the sausage, but the potatoes were bland. I enjoyed the fruit and yogurt, though. Yeah, I’m really glad I didn’t try to finish those potatoes. 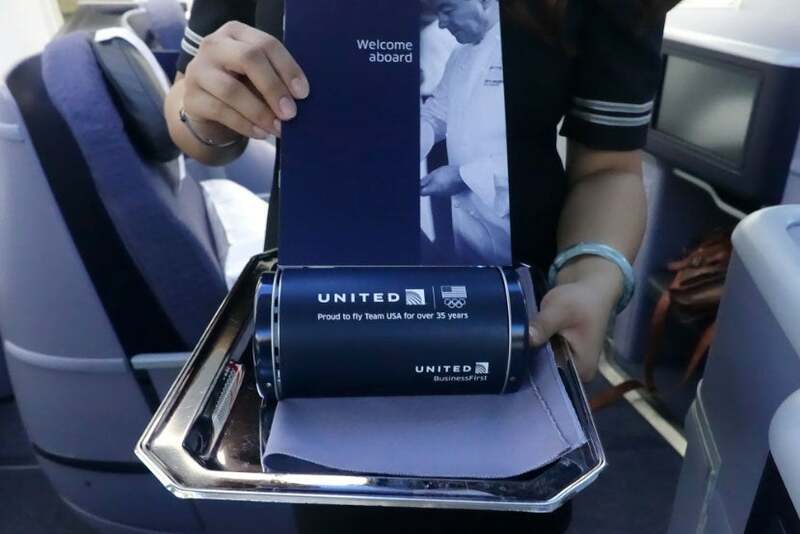 United typically offers both a cinnamon roll (delicious!) 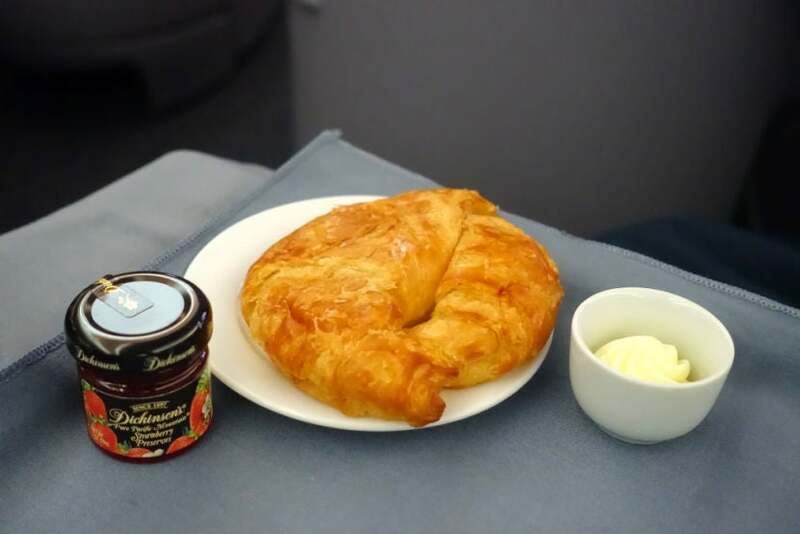 and a croissant (less delicious) with breakfast, but only the latter was available on this flight. I was still hungry after the main course, so I opted for a croissant. 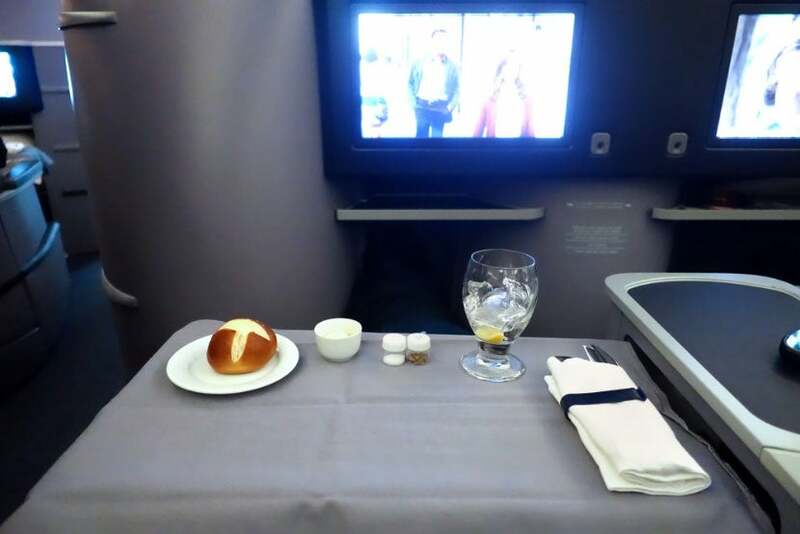 A few minutes after I finished my breakfast, we began our descent to Singapore. 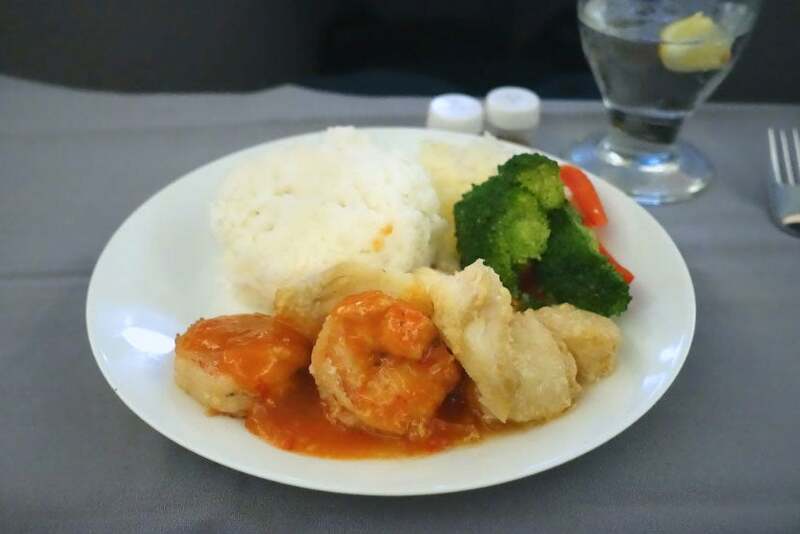 It was a bit bumpy, so I’m glad I had changed out of my pajamas (left over from a first-class Thai flight) before the final meal service. Just before we pulled into the gate, our 787-9 received the customary water cannon salute, which was a first for me (and most of the passengers around me, it seemed). Very cool! Check it out above. 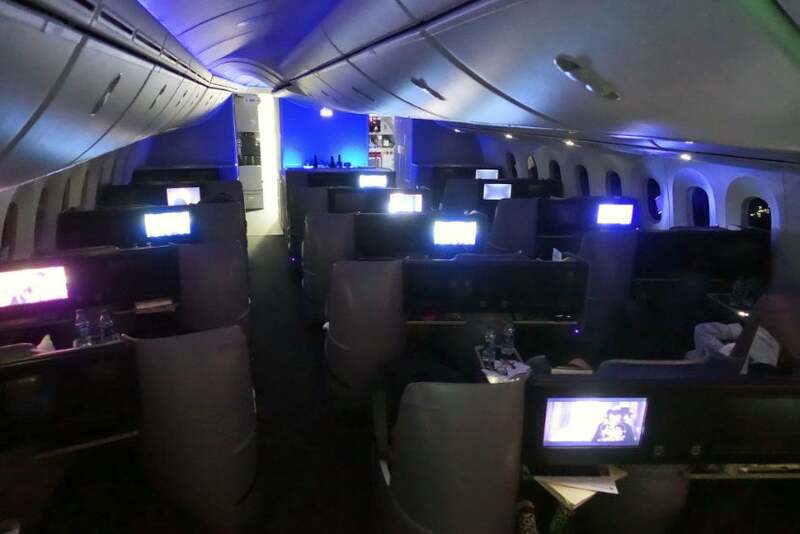 The cabin cleared out very quickly after the doors were opened — after 16+ hours on the plane, I’m not surprised! 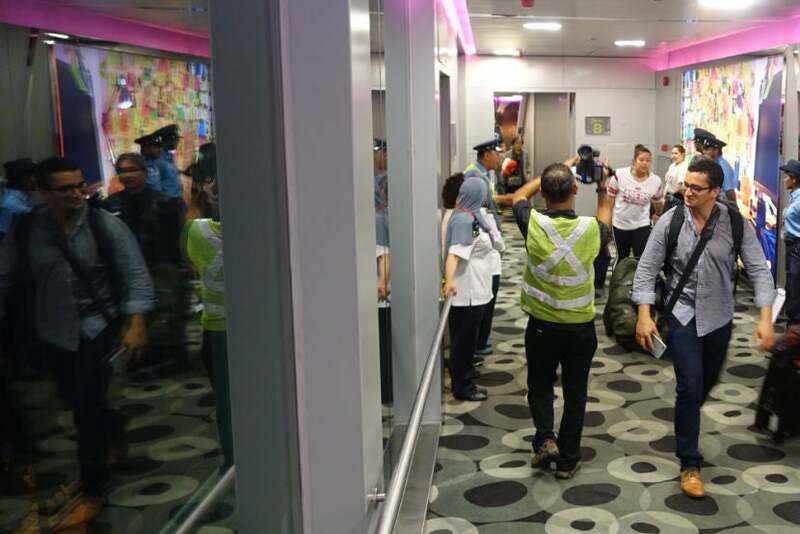 Deplaning passengers were greeted by a row of staff and cameras. 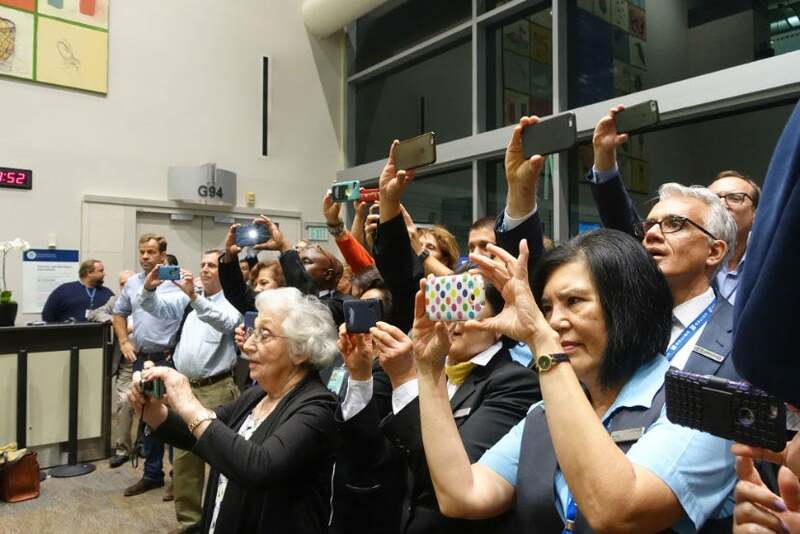 Some passengers paused to get one last look at our 787-9. And then there were more cameras. 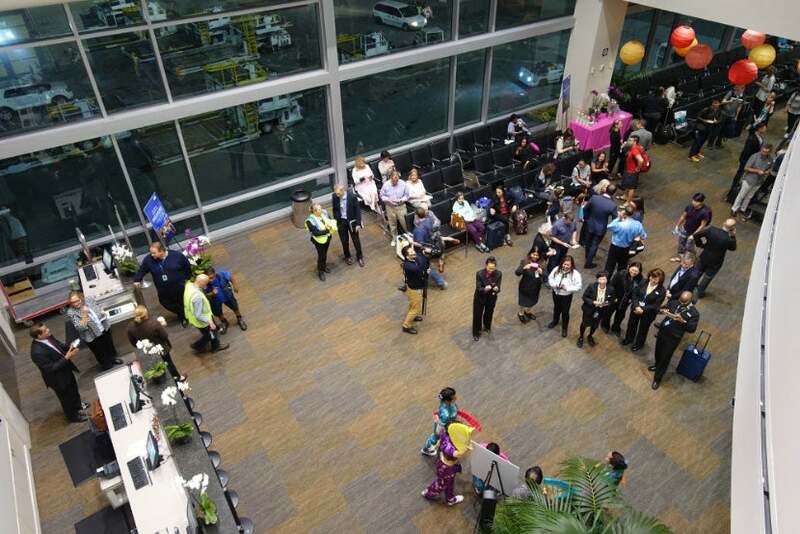 I certainly wasn’t looking my best after nearly 30 hours of travel (from the time I left my apartment in NYC), so I’m hoping this was some sort of internal airport video or something, rather than one of those United update videos that tends to roll before the safety demo plays. 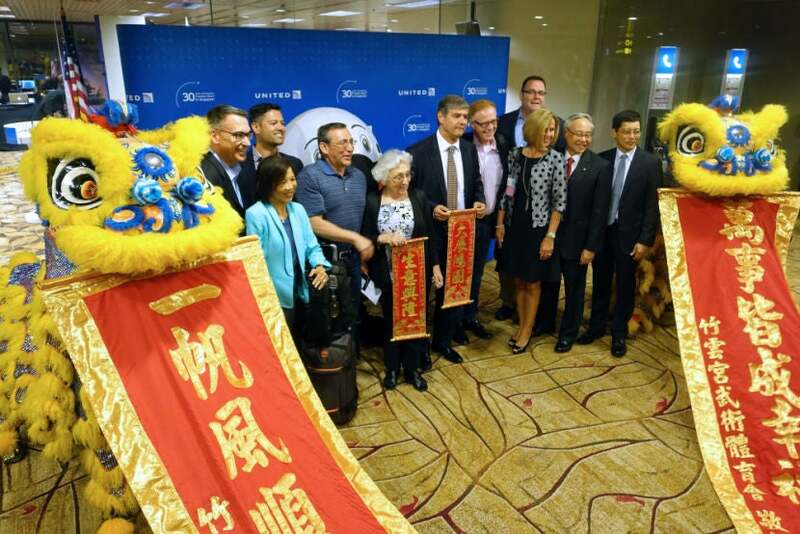 Interestingly, the gate area at Changi was also set up for a ribbon cutting — the SIN-SFO flight was an inaugural as well. And there were plenty of photo opportunities at SIN as well. 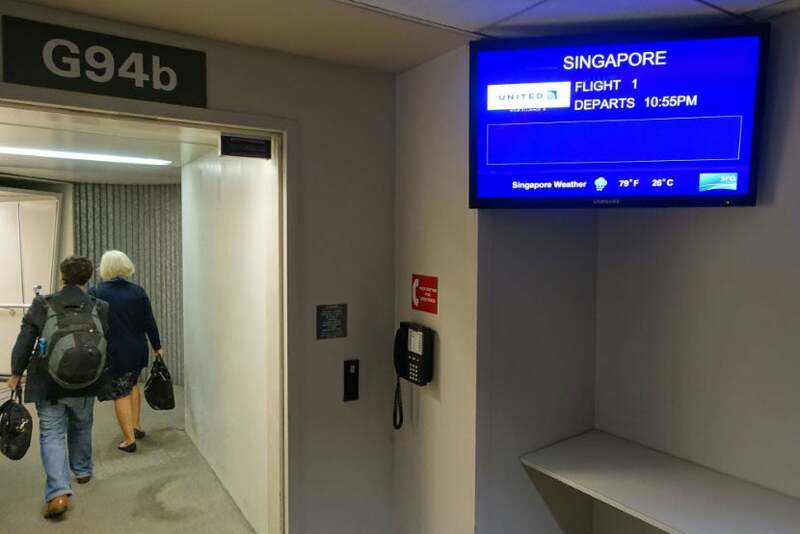 Singapore’s Changi Airport is known for its lavish amenities, ranging from a transit area swimming pool to a screened-in butterfly garden. I didn’t take advantage of any of those perks — after a few minutes of checking out the arrival festivities, I breezed through immigration and grabbed a $13 UberX ride to the Westin. 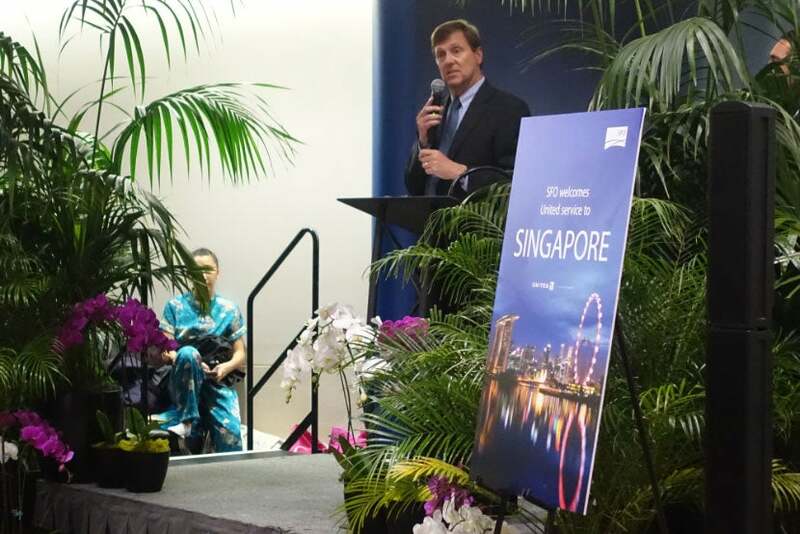 This was a special inaugural for me — I managed to grab an award seat on one of the very last nonstop flights from Newark to Singapore, so I was very excited to hear that nonstop US service would be available once again. 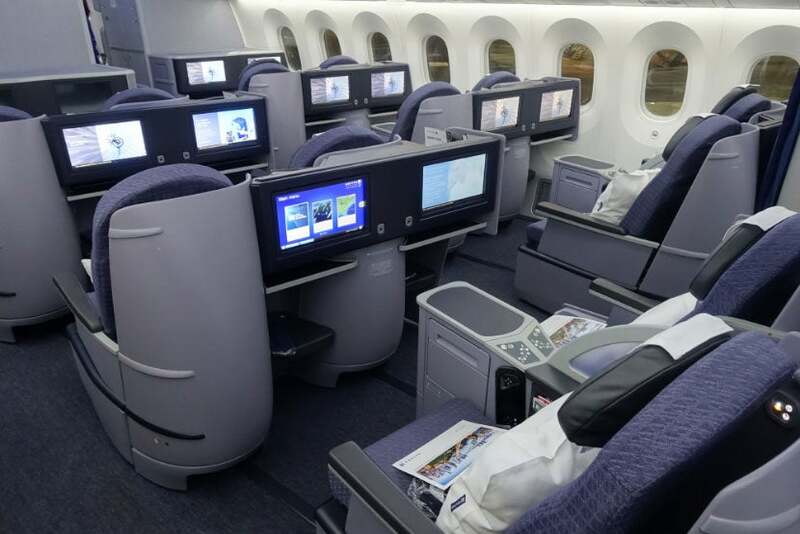 While Singapore’s business-class seats (even the dated version on the now-retired Airbus A340-500) offer much more space and privacy, I found United’s 787-9 to be much more comfortable overall, perhaps due in part to the higher humidity and lower altitude pressurization. 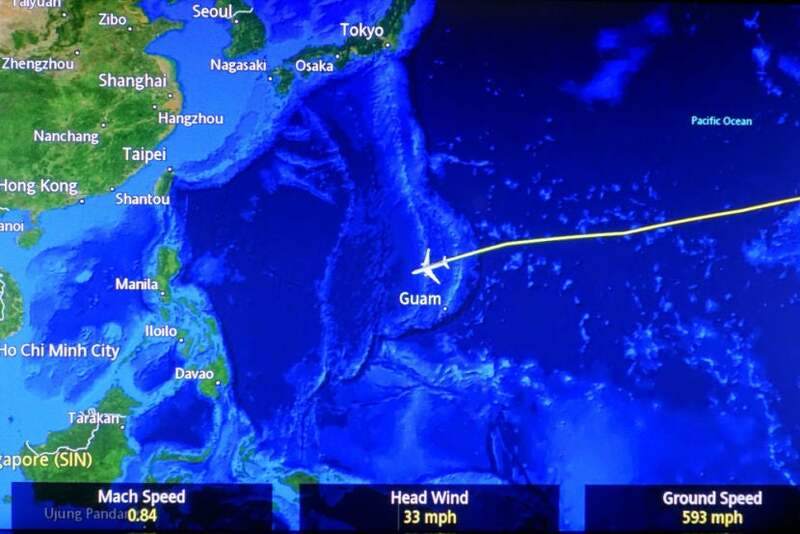 Even though we left on time, our flight arrived a few minutes late — perhaps due to the southerly route we took that had us flying near Honolulu and Guam, rather than via Tokyo. 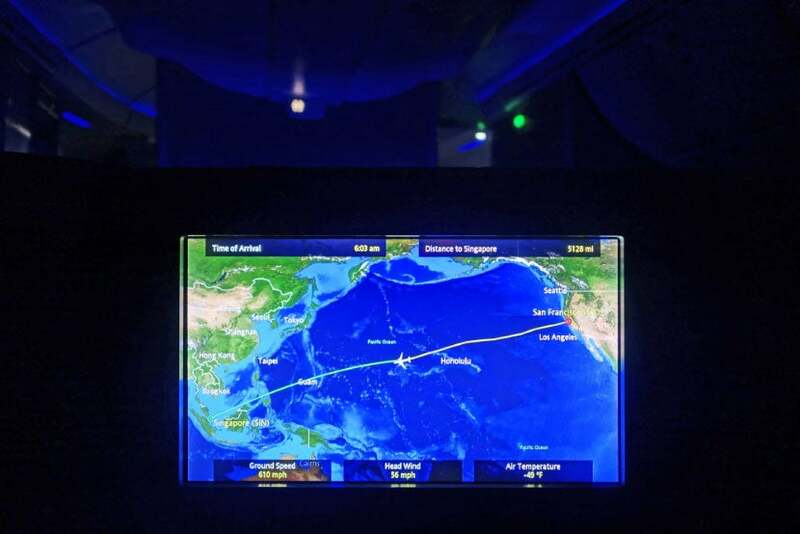 This route added more than 1,000 miles to the flight, though unfortunately I won’t be seeing any of those “bonus” miles hitting my frequent-flyer account. While I’ve been on a few “final” flights, and even a first flight of sorts, this was my first true inaugural. Everyone from the gate agents to the economy passengers seemed to be in a fantastic mood, which really helped to make the experience even more special. 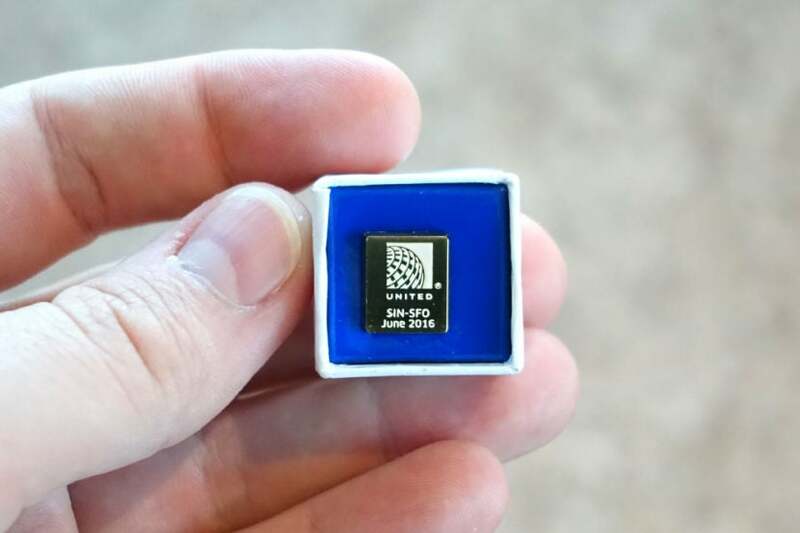 Having experienced this flight, I’m not sure I’d go too far out of my way for a United inaugural in the future, but it was definitely a great time. 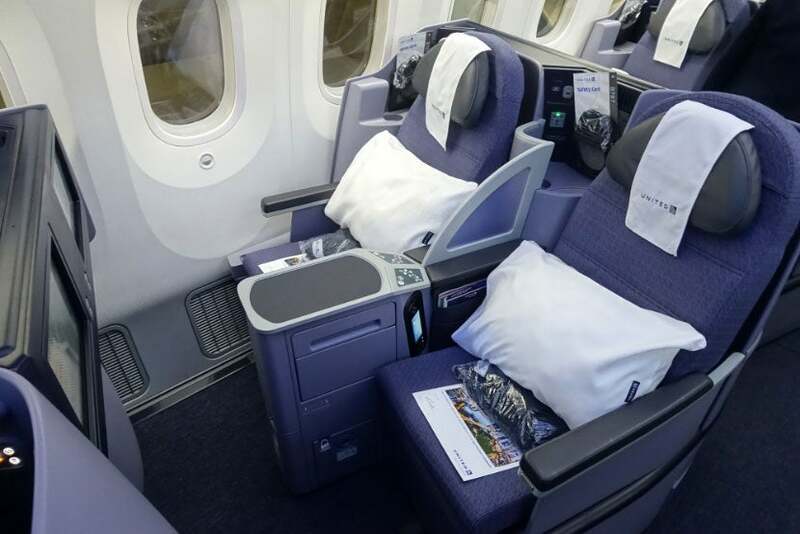 Ultimately, this shouldn’t be a “bucket list” flight — there are far better uses for your miles — but if you need to get from San Francisco to Singapore (or Southeast Asia in general), United flight 1 is hard to beat. 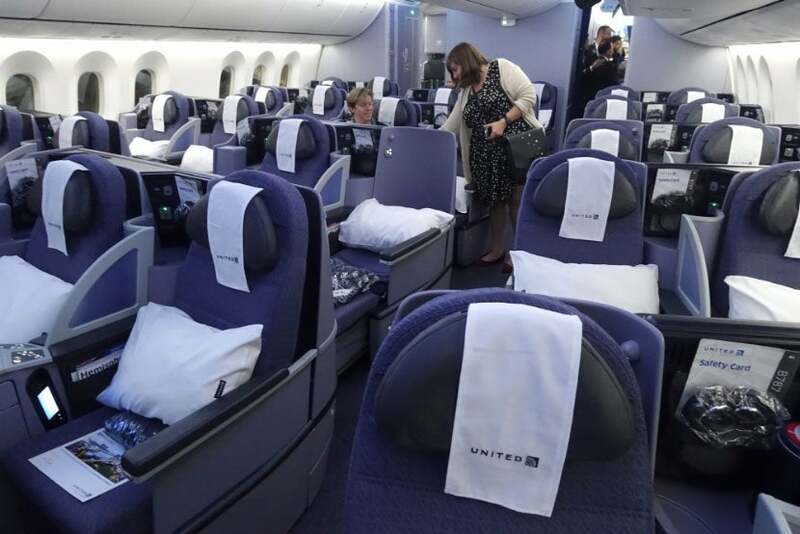 Will you be flying United’s nonstop to Singapore?